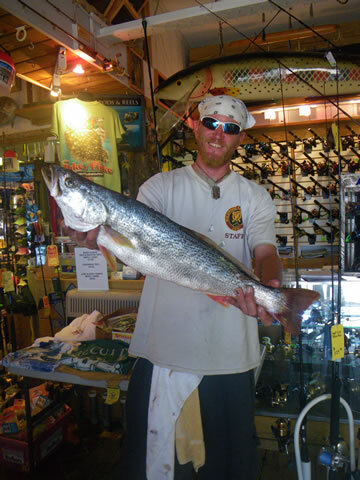 Your Source for Bait, Tackle, Rods, Reels, Lures and more from the Jersey Shore! 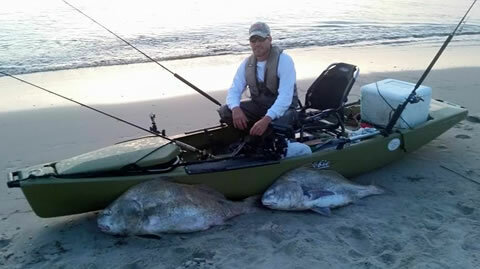 Jimmy Dickinson of Wildwood with a 10.1 pound puppy Black Drum caught while fishing on his Hobie Pro Angler 14 kayak in the back bays of Wildwood. 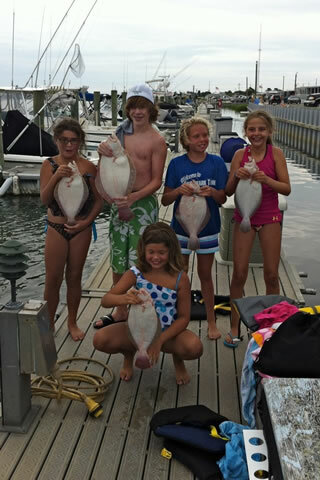 The Dunne Family of Collegeville, PA; Marina, Ray and Matt with a nice catch of Flounder from the Wildwood Reef. 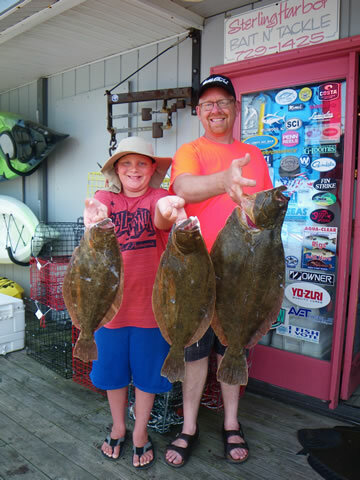 Robin Harbaugh and grandson Brian of Middletown, DE with a 5.65 pound Summer Flounder and 2 nice Sea Bass caught at the Wildwood Reef. 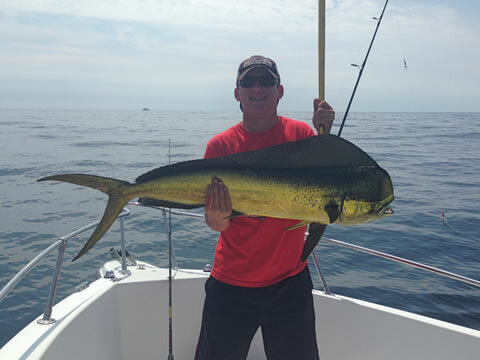 Tom D'Alfonso of Monroeville with a 16.6 pound Mahi-Mahi caught while trolling the 20 Fathom line on his boat Reel Trouble. 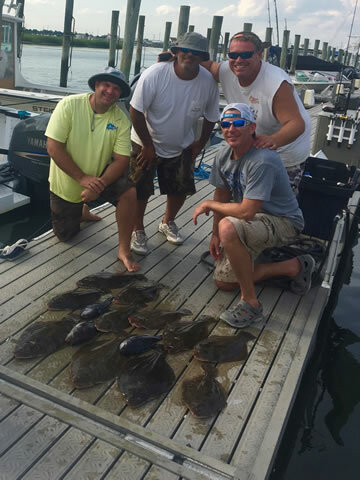 Scott Wheeler and crew of Scott's boat Big Bone out of Wildwood with 11 keeper Flounder caught at the Old Grounds. 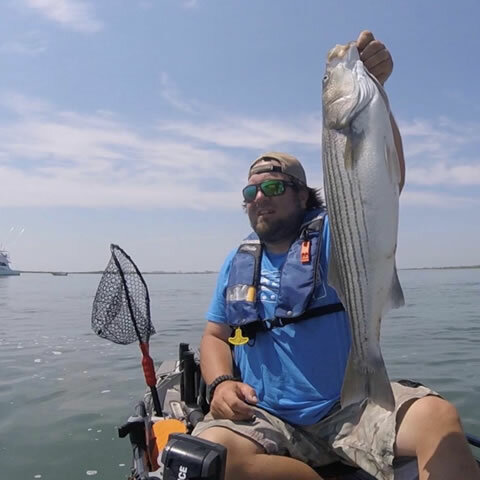 Charles Breon of Villas with a Striped Bass caught from his Hobie Kayak in the back bay. Capt. 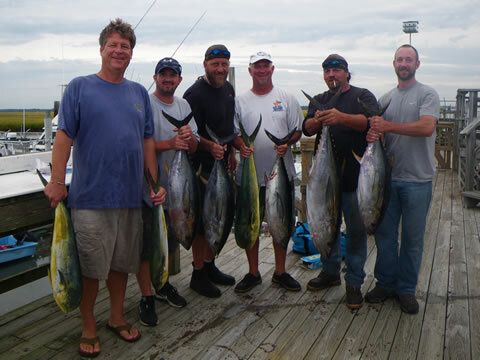 Bob McCormick and crew of Happy Our from Pottstown, PA with a nice catch of Tuna caught at the Canyons. 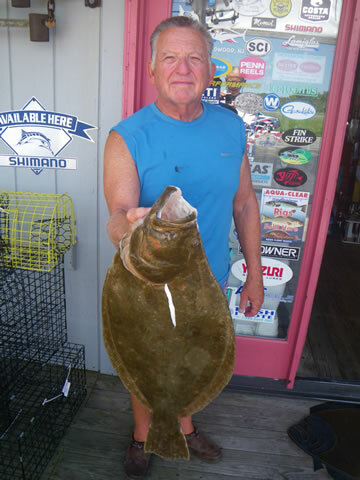 Jim Sullivan of Cape May Court House with a 4 pound 14 ounce Flounder caught at the Wildwood Reef. 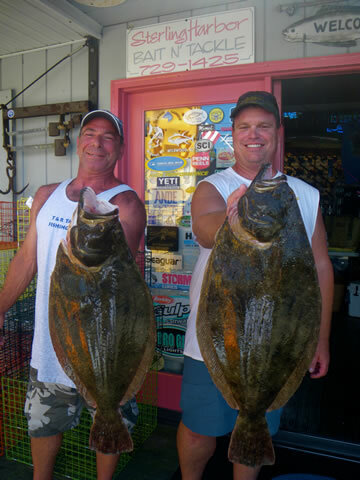 Joe Smith of SW Philly with a 6.83 pound Fluke caught at Reef Site 11 while fishing on Scott Wheeler's boat "Big Bone" out of Wildwood. 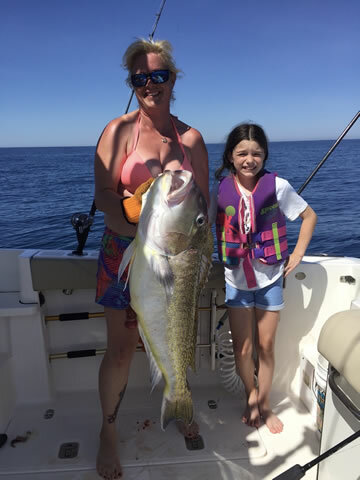 Sharon Bigwood with a nice Tuna caught while trolling the Canyons on her boat "Maddie Rose"
Sharon and Madeline Bigwood with a nice Tilefish caught while trolling on their boat "Maddie Rose" at the Canyons. 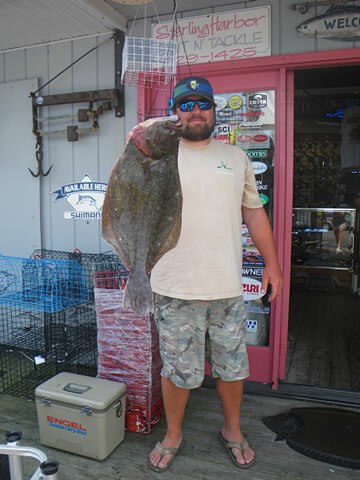 George Danley of Villas with a 5 pound, 11 ounce Flounder caught while fishing on his boat Liquid Asset behind the Wildwoods. 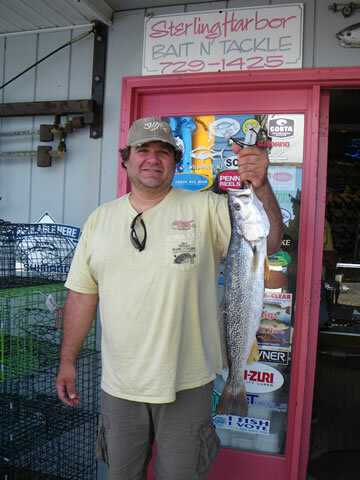 Captain Dan Guss of Erma with a 4 pound, 11 ounce Weakfish caught in the Wildwood back bays. 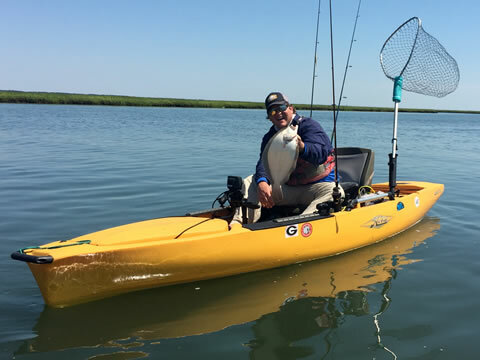 Mark Romalino of Williamstown, NJ with a 3 pound, 15 ounce Flounder caught behind Stone Harbor on his Hobie Mirage Pro Angler 14 Kayak. 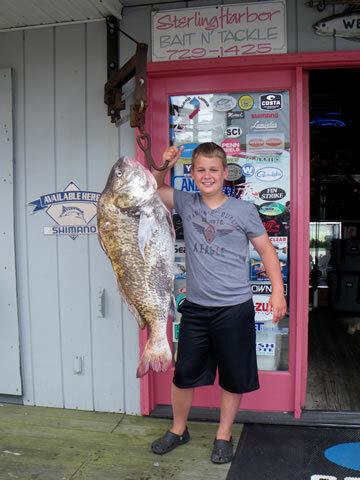 Luca Mazzille of Port Republic, NJ with a 37 pound Black Drumfish caught on Clam at Slaughter Beach. 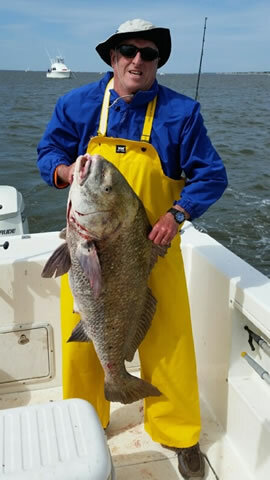 Tommy Ciocco of Hamilton, NJ with a 52 pound Black Drumfish caught on Clam at Slaughter Beach. 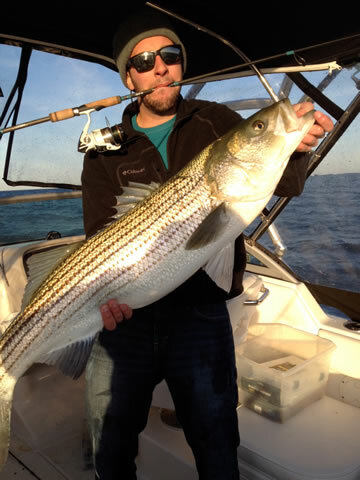 Joe Landis of North Cape May with a nice Striped Bass caught on a Mag Darter along the Delaware Bayshore. 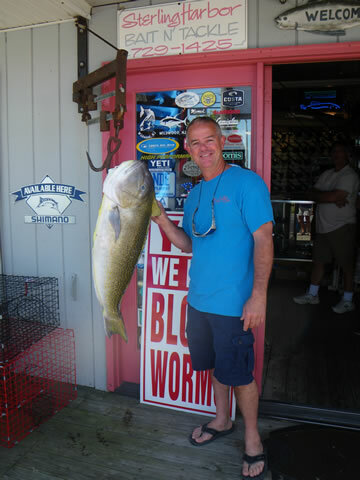 Bruce Fish of Wildwood with a 31 pound Stiped Bass, caught while trolling a Mann's Stretch 25. 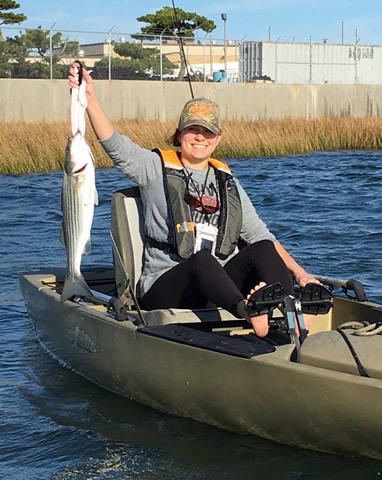 Laura Pierce of Chadds Ford, PA with a schoolie Striper caught & released in the Wildwood back bay on her Hobie Pro Angler 14 kayak. 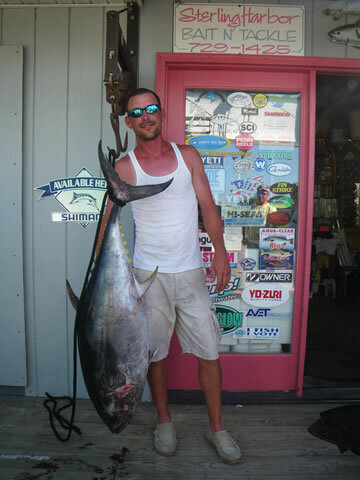 Ryan Worley of Wildwood with a 151 pound Bigeye Tuna caught while fishing the canyons on Tim McGregor's boat, "Reel Maniacs" out of Wildwood. 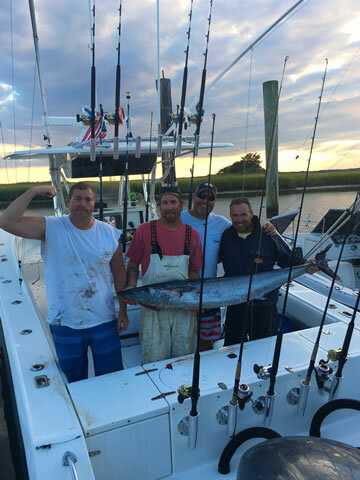 Frank Hennigan and crew from Glenmoore, PA with a 68 pound Wahoo caught while trolling near the 30 Fathom line on Frank's boat "Avalanche" out of Wildwood. 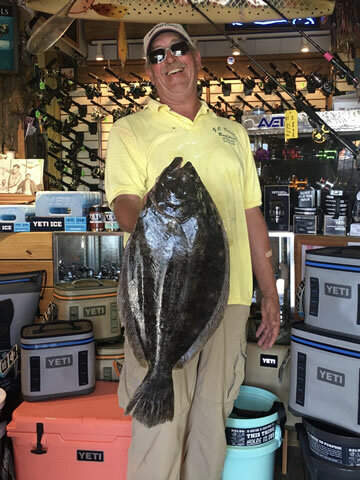 George Danley of Villas, NJ with a 7 pound 4 ounce Flounder caught while fishing the Capre May reef on his boat "Liquid Asset". 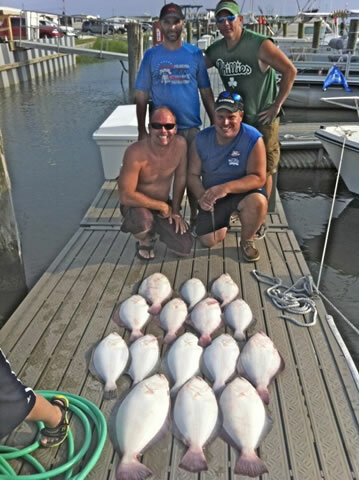 Mike Reed and crew of Rockledge, PA with a limit of Flounder from Reef Site 11 on Mike's boat "Kensington Princess II". Capt. 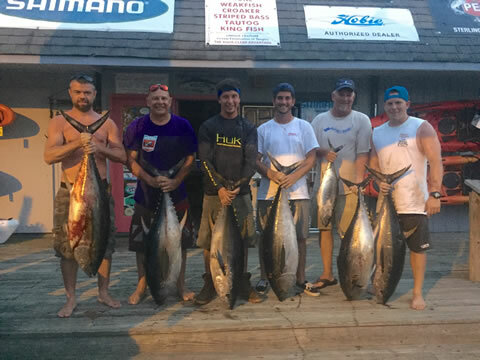 Bob McCormick and crew of the "Happy Our" of Pottstown, PA with Yellowfin Tuna to 57 pounds caught while chunking butterfish at the Hotdog. 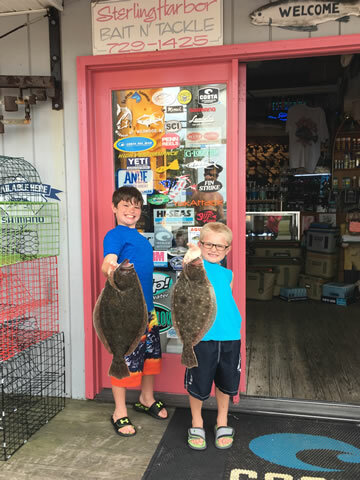 Brian Harbaugh, Jr. age 7 (right) and Ben Hynes, age 9 (left) of Middletown, DE with a 2.56 and a 4.16 pound flounder caught while fishing live minnows in the back bay on Pop-pop Randy Harbaugh's boat "Satisfaction"�. 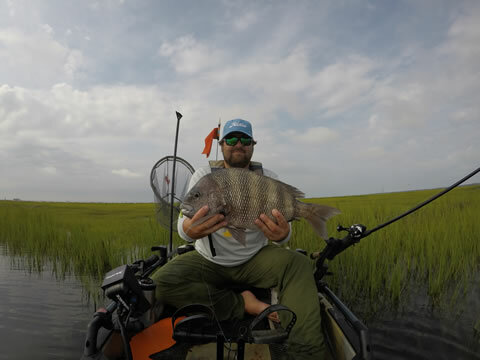 Kayak angler Charles Breon of Villas, NJ with an 8.32 pound Sheepshead caught while fishing the sod banks behind Wildwood on his Hobie Mirage Pro Angler 14. 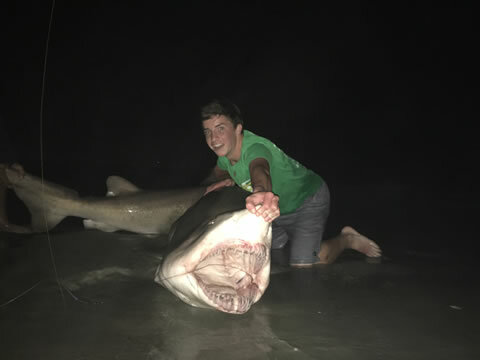 Sixteen year old Danny Miller of Havertown, PA released a large Sand Tiger shark caught while fishing in the Cape May surf. 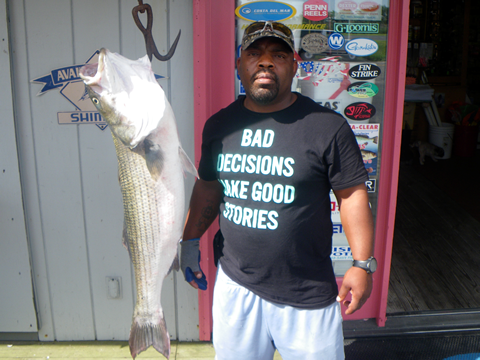 Roy Lucadema of Cape May Court House, NJ with an 18 pound Striped Bass caught 6/28/17 at the Cape May Inlet on a bucktail tipped with Gulp!. 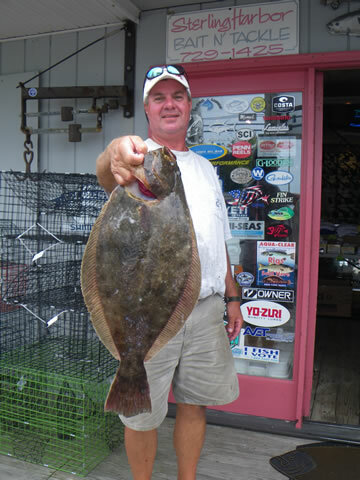 Joe Smugeresky of Collegeville, PA with a 23" flounder caught near the Cape May drawbridge. 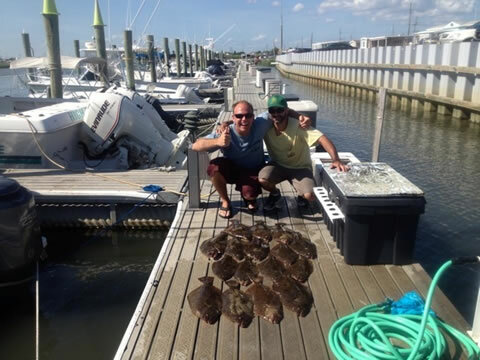 Todd Spence and Bobby Gentile of Gloucester City, NJ with a nice catch of flounder from the back bays of Wildwood. 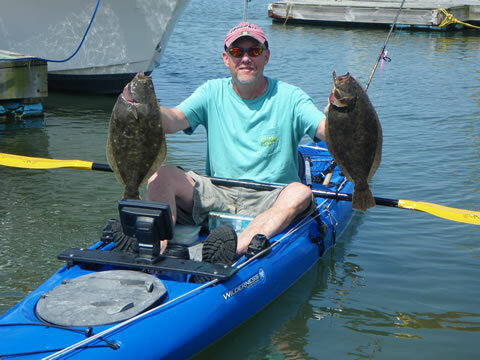 Charles Breon of Villas, NJ wiwth a nice founder caught behind the Wildwoods on his Hobie Mirage Pro Angler kayak! 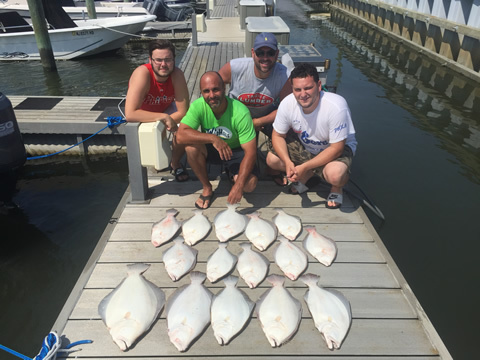 Frank Hennigan and crew from Glenmoore, PA with a limit of flounder caught at Reef Site 11 on his boat "Avalanche" out of Wildwood. 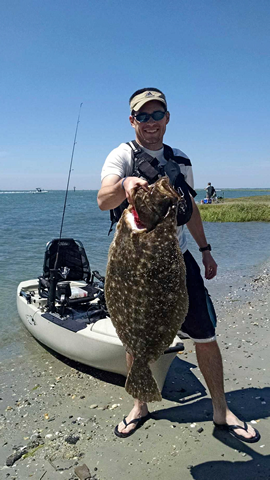 Justin Fesler of Woodbine, NJ with a 6 pound flounder caught on his Hobie Mirage Pro Angler 14 kayak behind the Wildwoods. 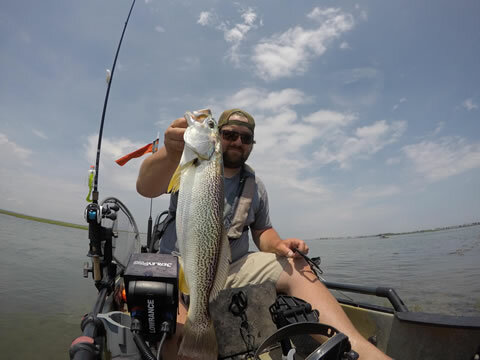 Charles Breon of Villas, NJ with a nice weakfish caught behind the Wildwoods on his Hobie Mirage pro Angler 14 kayak. 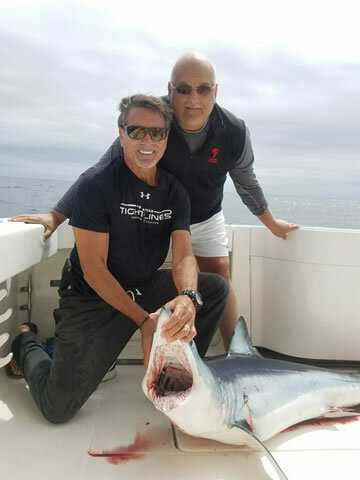 Peter and Bobby DiLullo of West Chester, PA with a 130 pound class Mako Shark landed on their boat "three Pete" out of Wildwood. 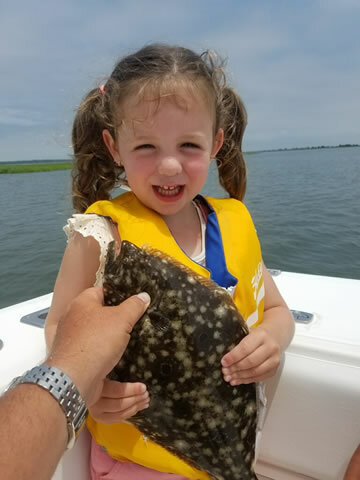 Three year old Molly Hennigan of Glenmoore, PA with her first keeper flounder caught behind the Wildwoods while fishing with Dad. 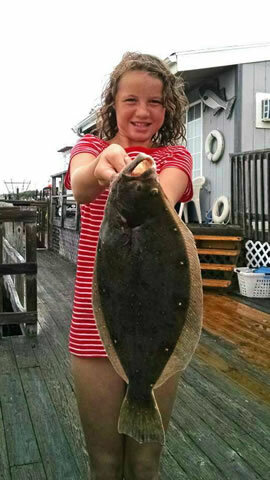 Jess DeJoseph of Wildwood, NJ landed her first keeper flounder from her Hobie Standup Paddle Board! 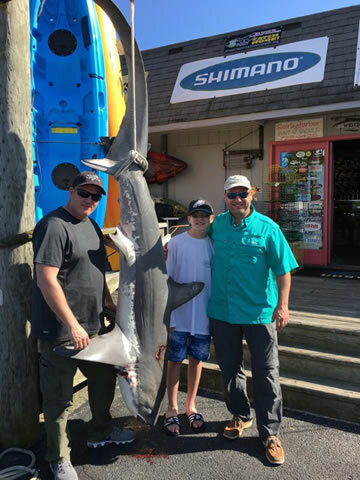 Thomas Dalfonso and crew Thomas, Jr. and Mike Dougherty of Elk Township with a 12 foot Thresher Shark weiging in at 293 lbs. 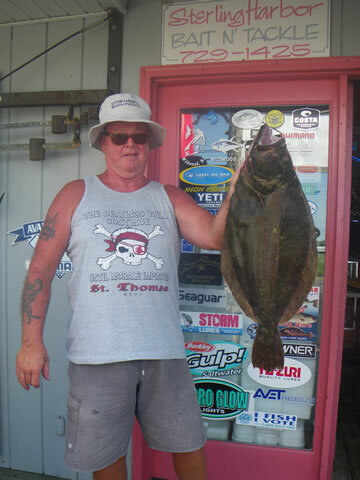 The fish was caught near the 30 Fathom line on Thomas' boat "Reel Trouble" out of Wildwood. Bill Stewart of Swedesboro, and Bob Fritz of Philadelphia with a nice Tilefish caught on the edge of the Wilmington Canyon on Bill's boat "Tuna Can". 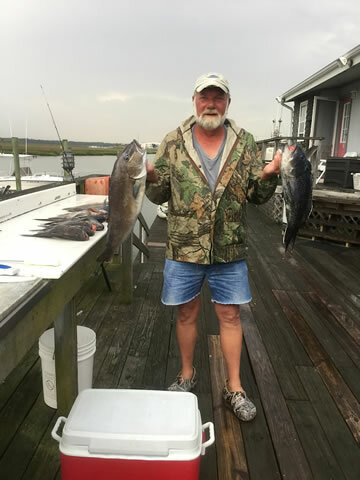 Bob Fritz of Philadelphia with a nice Sea Bass and Tilefish caught while fishing with his brother Harold on his boat "Justin Time" out of Wildwood Crest. 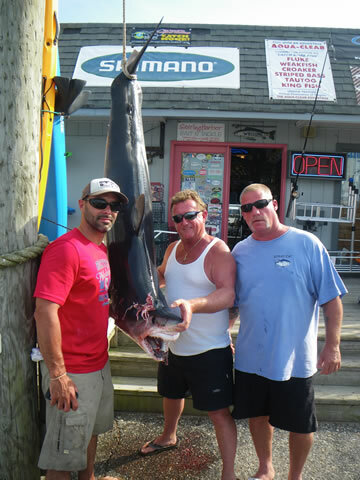 Mako Shark caught by the crew of "Avalanche" out of Wildwood, NJ - Capt. 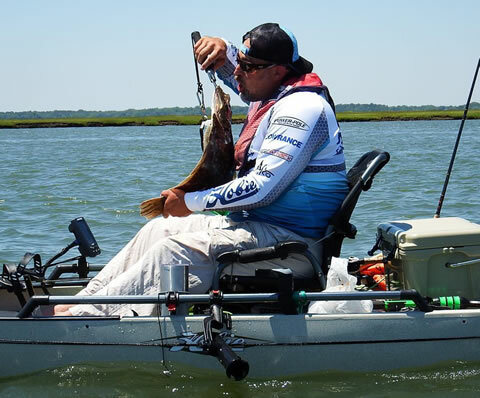 Frank Hennigan of Glenmoore, PA.
Justin Fesler of Woodbine, NJ with a 20-inch flounder caught from his Hobie Pro Angler 14 kayak. 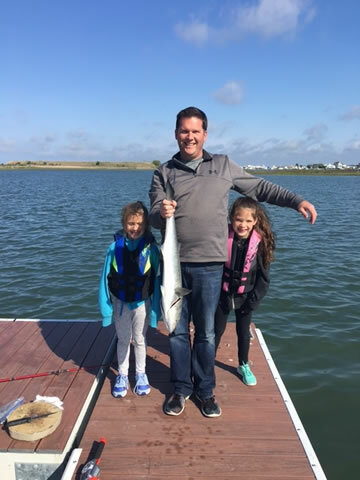 James Rahn with daughters Mia and Ella of Wildwood Crest with one of two nice bluefish caught on bunker near Sunset Lake. 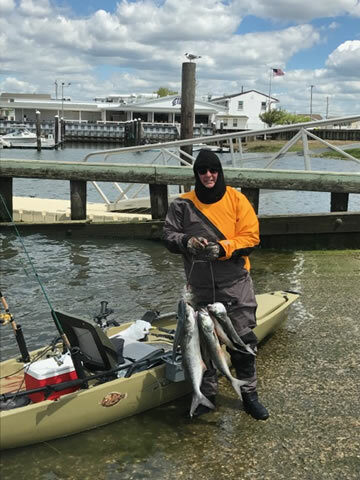 Ed Brown of Williamstown, NJ with a nice stringer of bluefish caught on his Hobie Mirage pro Angler Kayak behind North Wildwood. Congrats to Stacey! 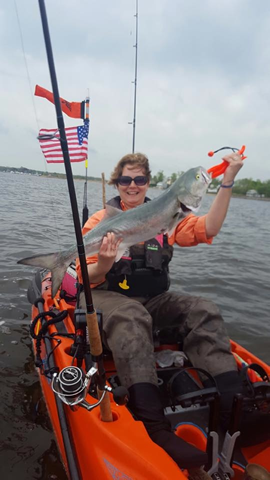 She battled 9 of these choppers from her Hobie Outback kayak. Sharon Bigwood of Woolwich Twp. 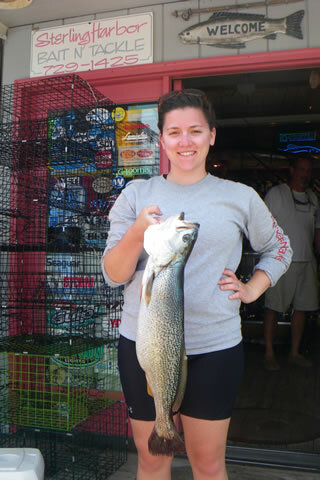 with a 73 pound Whaoo caught while trolling the Elephant Trunk on her boat Maddie Rose out of Wildwood, NJ. 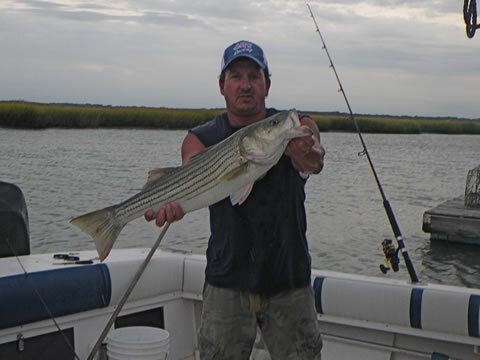 Ray Pashuk of Wildwood Crest with a schoolie Striper caught from the surf on a top water plug. 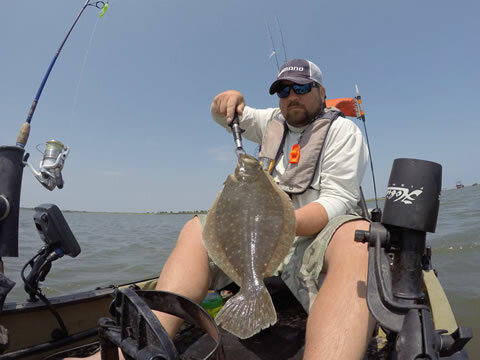 Charles Breon of Villas, NJ with a nice Flounder caught in the back bays of Wildwood on his Hobie Pro Angler 14 Kayak. 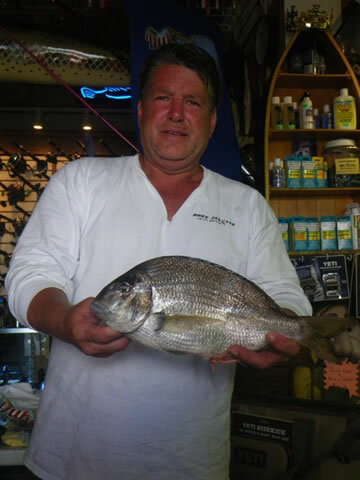 A 2 pound, 10 ounce Porgy caught by Jim McGinty of Philadelphia, PA at the Cape May Reef. 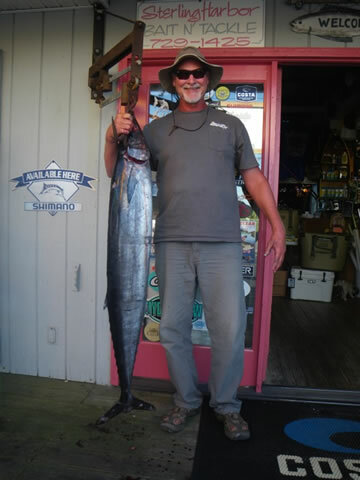 Gene Cuneo of Atco, NJ with a 41 pound Wahoo caught while trolling the Massey Canyon area. 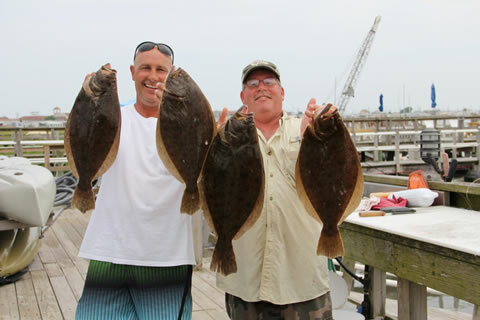 Jim Messina of Willow Grove, PA with a 7 pound 2 ounce Flounder and Scott Wheeler of Wenonah, NJ with a 7 pound 7 ounce Flounder caught at the Cape may Reef while fishing on Scott's boat "Big Bone" out of Wildwood. 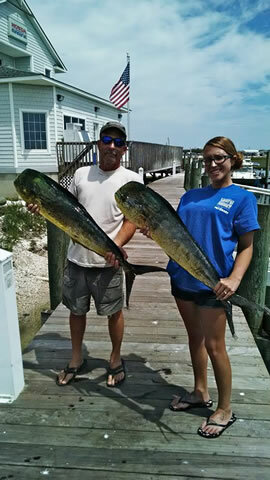 Roy Lukadema and daughter, Ashley Bakley of Dias Creek, NJ with a pair of nice Mahi-mahi trolled at the East Lump area. Six year old Mason Baracliffe of Blackwood, NJ with a 12 inch Kingfish caught on bloodworm from the Cape May surf. 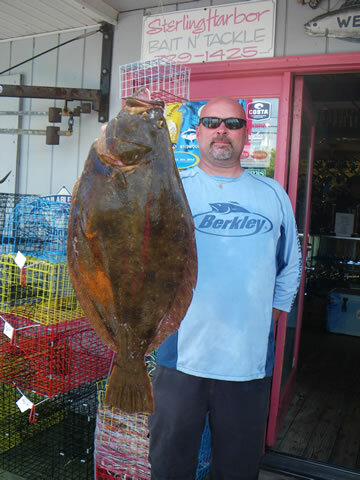 Mike DeLio of Boothwyn, PA with a 6.54 pound Flounder caught at the Cape May Reef while fishing on his boat High Hopes. The crew if the Fishaholic; Andrew, Alex, and Arch Fedkiw from Wildwood Crest caught this mix of Mahi, Bluefin and Yellowfin tuna while on an overnight chunking trip at Massey's Canyon. 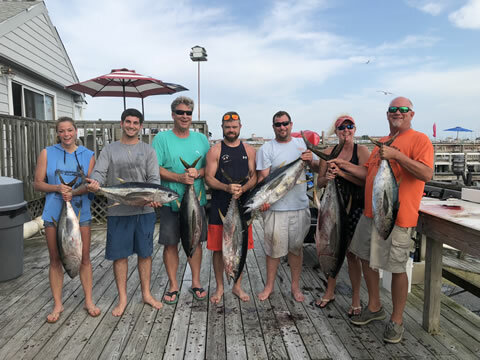 Mike Reed and crew of Rockledge, PA with a nice catch of Tuna, caught while chunking and jigging as Massey's Canyon on Mike's boat, "Kensington Princess". 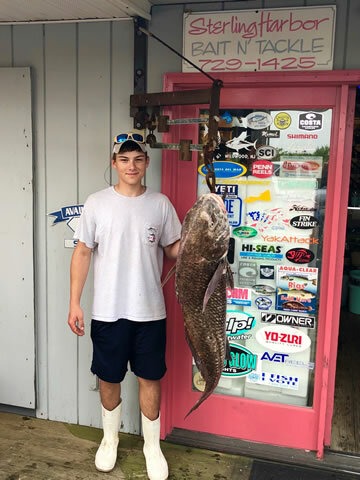 Sean McIlhenny and Matt Lattanzio of Woolwich, NJ with an 8 pound, 3 ounce Flounder caught at the Cape May Reef on a live minnow while fishing on Sean's boat, "KelseA". The fish measured 27 inches. 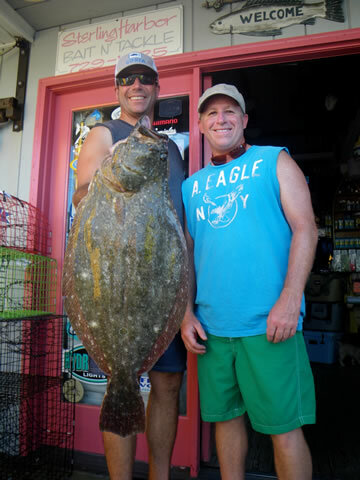 Randy and Brian Harbaugh of Middletown, DE with flounder up to 24 inches from the Cape May Reef. 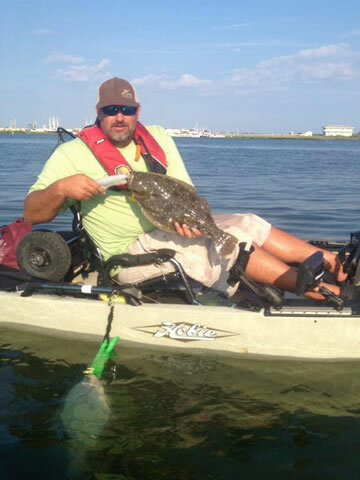 Bill Bittmann, Jr of South Dennis with a keeper flounder caught from his Hobie Mirage Pro Angler 14 Kayak. 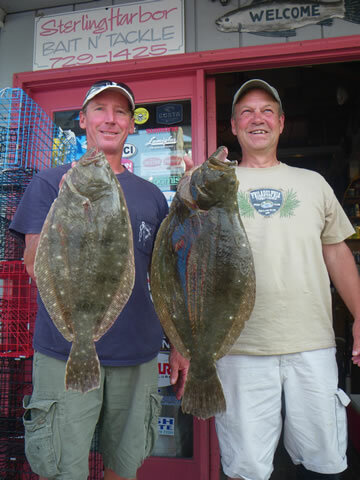 Bob and Randy Harbaugh of Middletown, DE with Flounder to 4 pounds from the Cape May Reef on Father's Day. 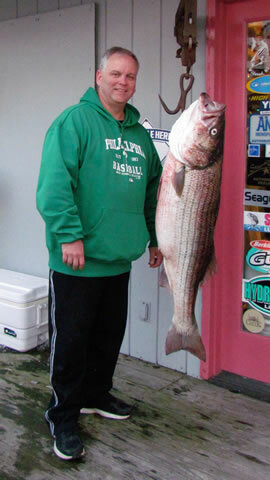 Rodney Searcy of Wildwood, NJ with a 27.5 pound Striped Bass caught from the Cape May surf on bunker. 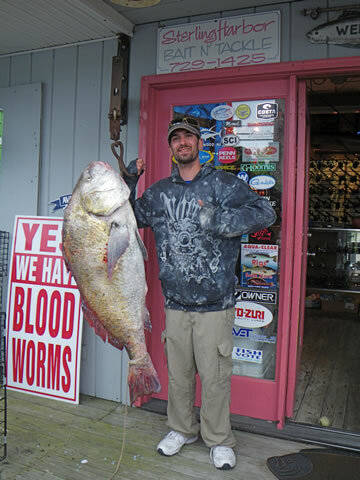 Brandon Olewiler of York, PA with his first ever Drumfish that tipped the scale at 49 pounds! 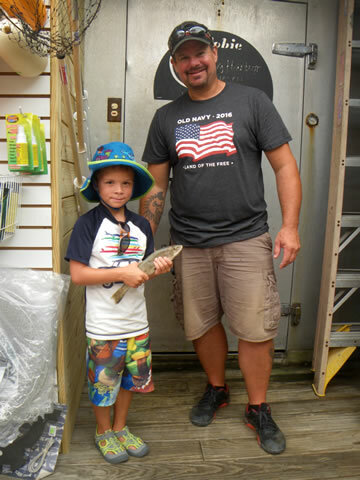 The fish measured 41 inches and Brandon caught the fish on clam in the Delaware Bay while fishing on Dad's boat, "SS Scrappy". 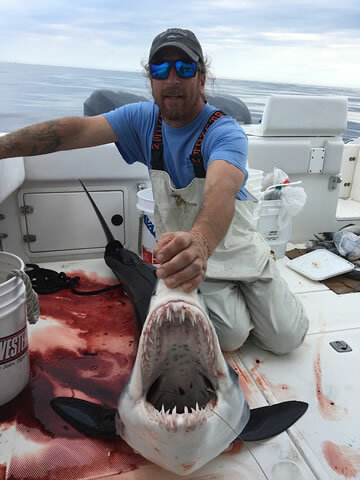 The crew of Scott Wheler's boat "Big Bone and angler Bill Nolan of Philadelphia with a 110 Pound Mako Shark caught along the 30 Fathom Line on a Mackerel. 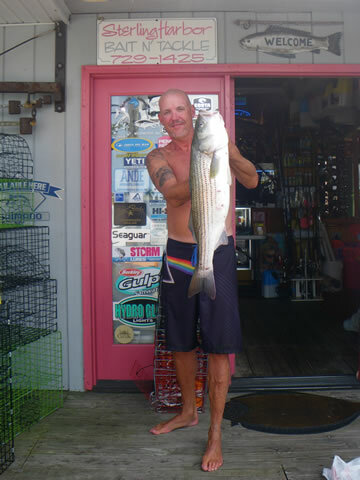 Mike Williams of North Cape May with a 9 pound and a 6 pound Bluefish caught from the Ocean City fishing pier. 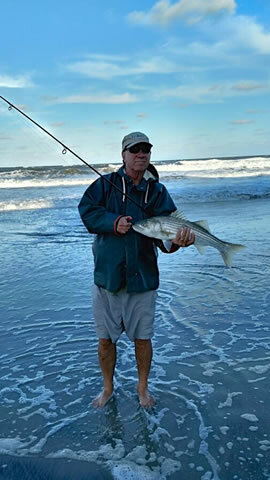 Bill Collins with his 30 poind striped bass caught on bunker in the North Cape May surf. The fish measured 43 inches. 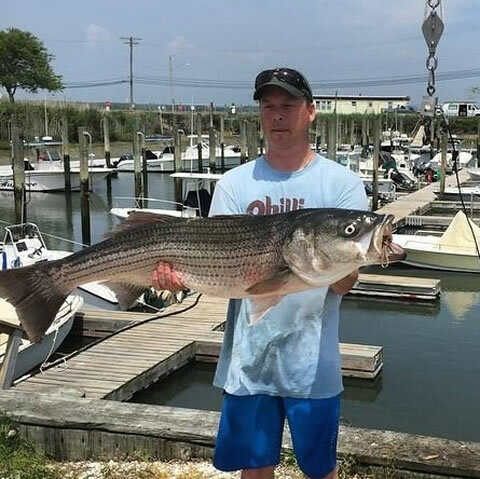 Frank Scirrotto of Cherry Hill, NJ weighed in a 40 pound, 3 ounce Striped Bass caught while chunking bunker in the Delaware Bay from his boat, Stinky Fingers. 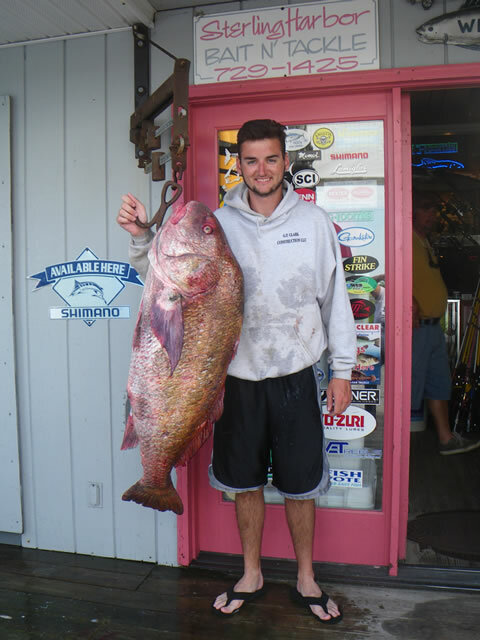 Luke Dombrowski of North Cape May, NJ with a 67 pound Black Drum caught in Delaware Bay from his boat, Thunder. 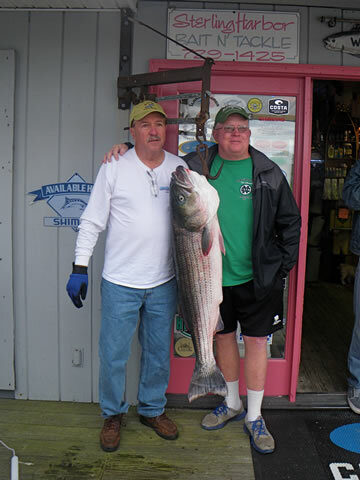 Bill Collins of Glendora, NJ with a 36 pound, 46 inch Striped Bass caught in the North Wildwood surf on clam. 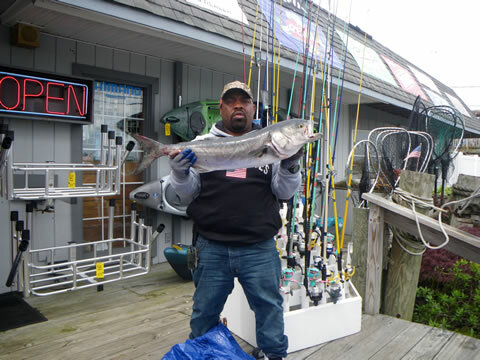 Lance Rodney with a 12 pound Bluefish that measured 36 inches. The fish was caught in the back bay of Wildwood on bunker. 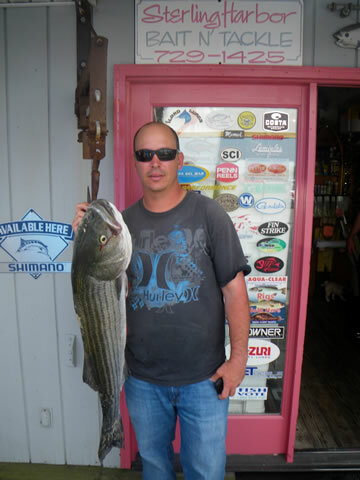 Brian Richie of North Wildwood, NJ 1ith a 21 pound Striped Bass caught on bunker. 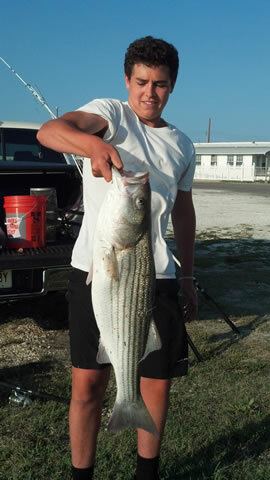 Thomas Baker of Spring Hill, FL landed this 51 pound Striped Bass on bunker from the North Wildwood surf. The fish measured 51 inches. Congrats Tom!! 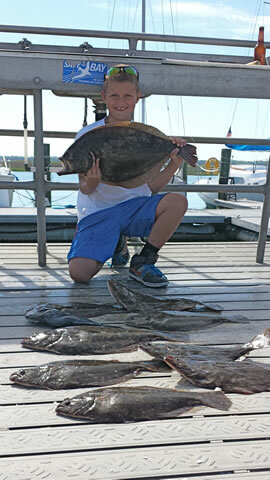 DJ Zolna, age 12 of Rio Grande, NJ checked in with his first Flounder of the season. The fish took a bucktail tipped with a Mackerel strip. It weighed 3 pounds and measured 21 inches. 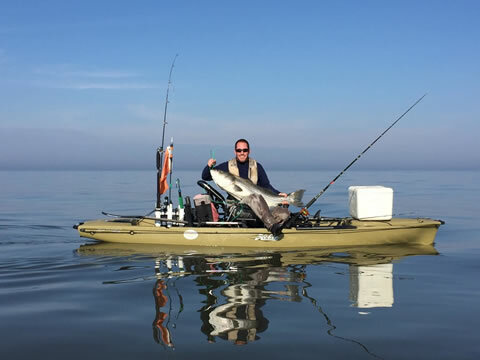 Mike Brier of Villas, NJ (Sterling Harbor Kayak Fishing Team) with a 43.5" Striped Bass caught from his Hobie Pro Angler 14 Kayak near Cape May, NJ on December 12, 2015. 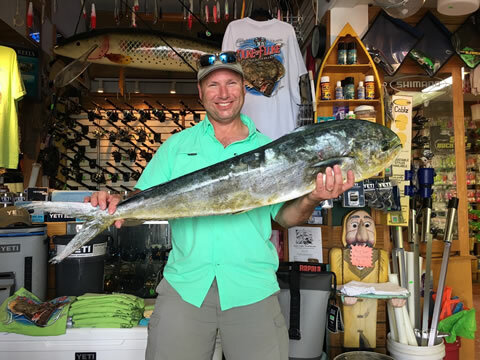 Steven Hoyer of Boyertown, PA weighed in a 24 pound mahi-mahi caught while trolling the canyons on Joe Gillen’s boat Y-Knot out of Wildwood. 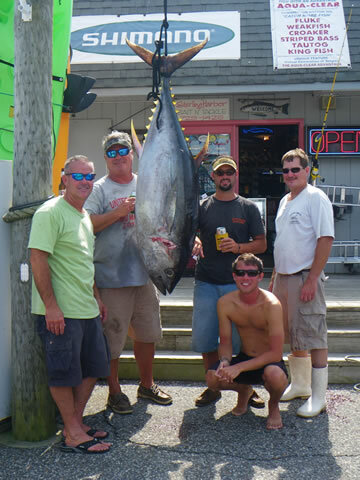 Angler Dave Kerr, of Gloucester City, NJ and crew of the Lisa Marie with a 250 pound bigeye tuna caught at the Wilmington Canyon. 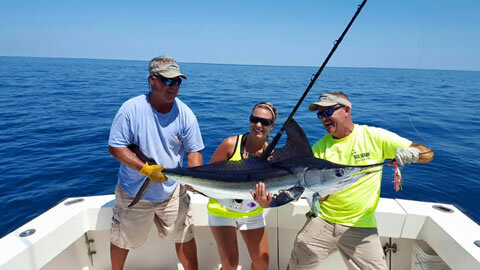 Brooke Sarter of Cape May Court House, NJ with her first ever white marlin! 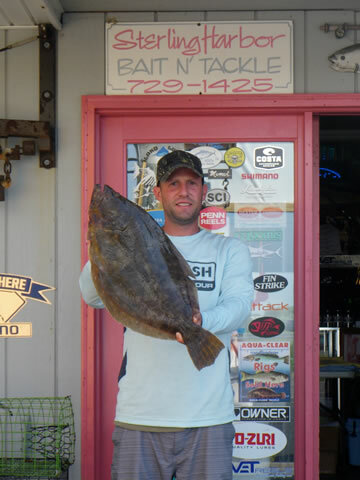 The fish was caught and released while fishing the Wilmington Canyon on Joe Gillen's boat "Y-Knot" out of Wildwood. 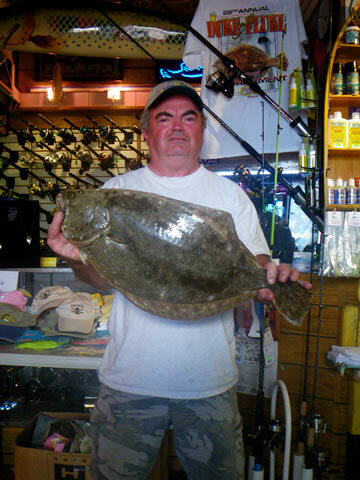 George Graeber of Cherry Hill, NJ with a 6 pound 11 ounce flounder caught at the Cape May Reef. 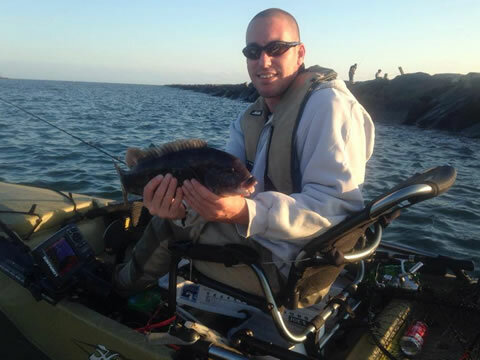 Michael Barnes of Levittown, PA with a 4.5 pound Tautog caught along the sod banks behind Avalon. 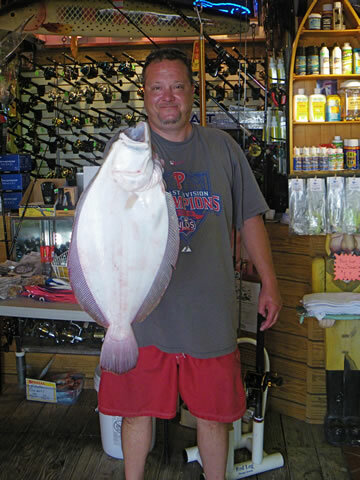 Paul Brosman of Maple Shade, NJ weighed in a 7.56 pound flounder caught while fishing the Cape May Reef on his boat Miss Tammy. The fish measured 26 inches. 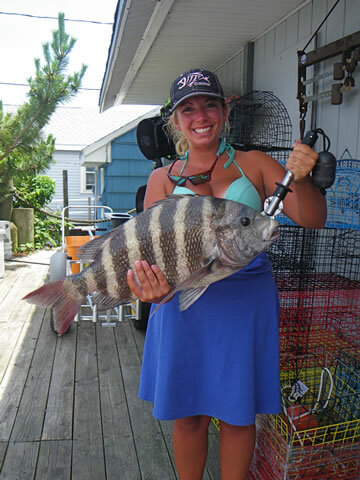 Ashley Edwards of Sellarsville, PA weighed in a 10 pound 2 ounce Sheepshead caught while fishing near Grassy Sound. 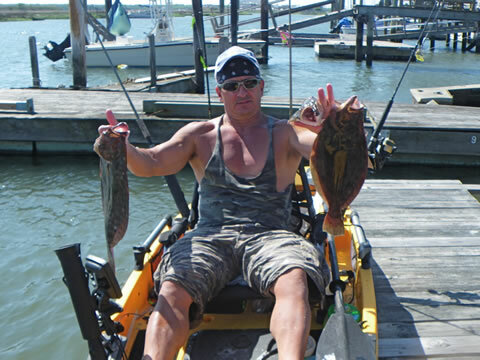 Jimmy Dickinson of Rio Grande, NJ with a 4.7 and a 3.45 pound flounder caught while fishing from his Hobie Pro Angler 14 Kayak behind the Wildwood's. 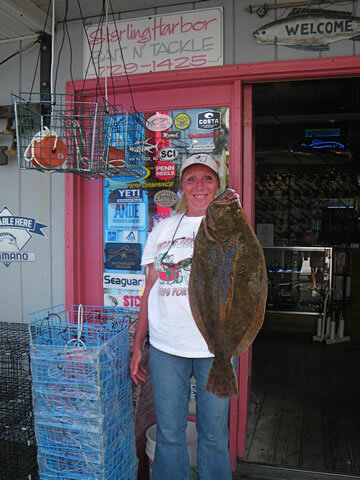 Marguerite Spina of West Chester, PA with a 6.93 pound flounder caught while drifting Gulp! behind the Wildwood's on her boat Tracey Anne. Angler Bob Strausser of Birdsboro, PA and crew of Joe Gillen's boat Y-Knot with a 125 pound bigeye tuna caught at the Wilmington Canyon. 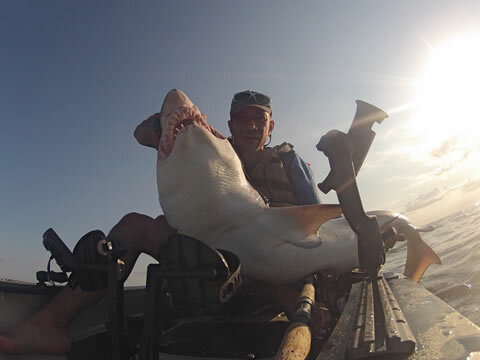 Charles Daugherty with a nice keeper caught on his Hobie Pro Angler kayak near Grassy Sound. 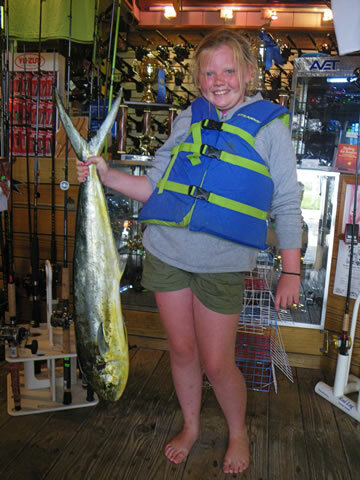 McKenna Vessels, age 10, of Wildwood, NJ caught a 10 pound 6 ounce mahi-mahi on a jig while fishing near FFB Bouy on Dad's boat Miss McK+3. 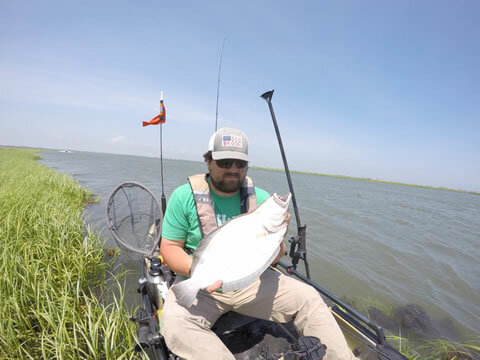 Charles Breon of Villas, NJ caught this 5 pound 3 ounce flounder on mackerel while fishing the Grassy Sound area on his Hobie Pro Angler kayak. 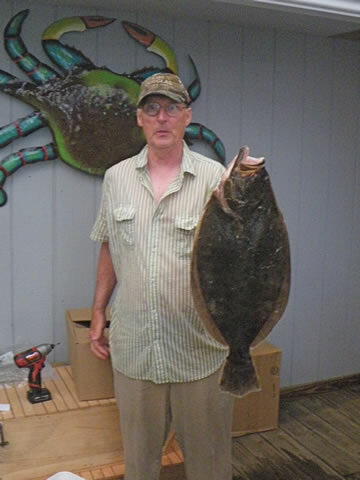 Steve Wagner of Turnersville, NJ with a 6 pound 14 ounce flounder caught on a buck tail tipped with Gulp! while fishing behind the Wildwood's on his boat Lauren Yvonne. 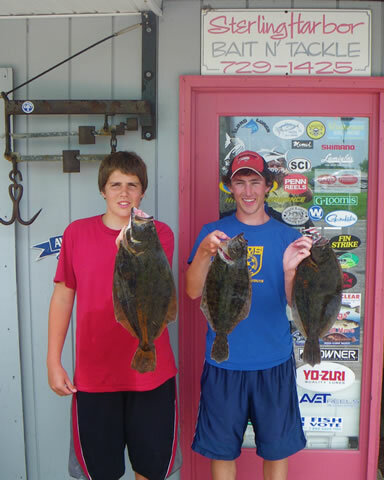 Ryan Hagen (right) of Royersford, PA with a 4 pound 5 ounce flounder and Brook Leon of Springfield, PA with a 2 pound 5 ounce flounder caught at the Cape May Reef on a squid/minnow combo. 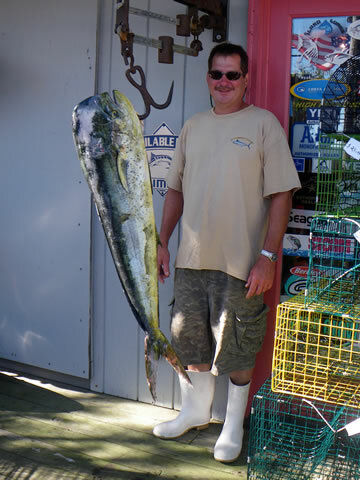 Scott Nave of Goshen, NJ with a 19 pound mahi-mahi caught at the Teacup area while fishing on the "Y-Knot" out of Wildwood. 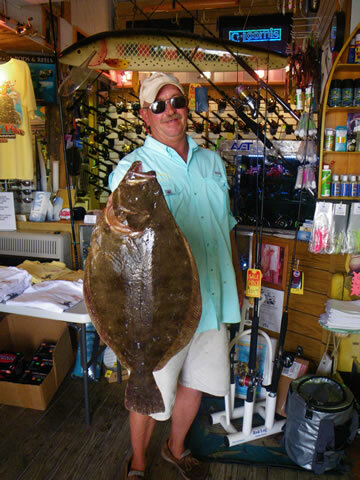 Allan Lehman of Greencastle, PA with an 11.37 pound flounder caught from his Hobie Mirage Pro Angler Kayak! 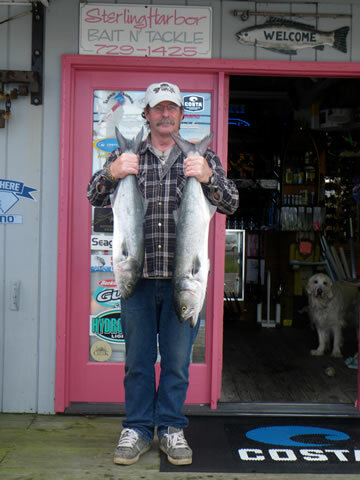 Bill Henfey, Jr. with a nice tide runner caught on a pink Zoom near Cold Spring Inlet. 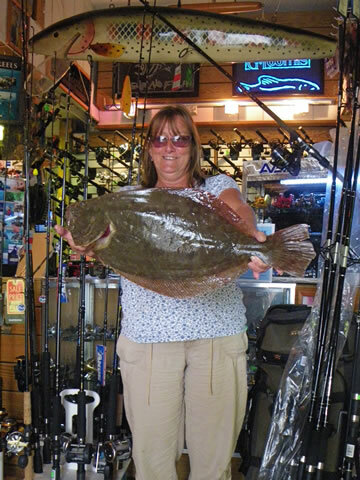 Jean Reid of Woodbury heights, NJ checked in with a 4 pound, 11 ounce flounder caught at the Cape May Reef on her boat Hog 'Em All. The fish was caught on a live minnow. 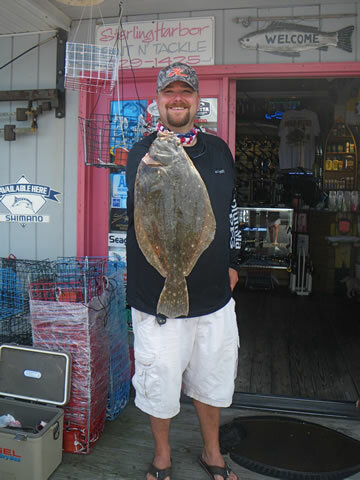 Ray Flexer of Perkasie, PA checked in with a 3.5 pound flounder caught on a mackerel strip in the Wildwood back bays. 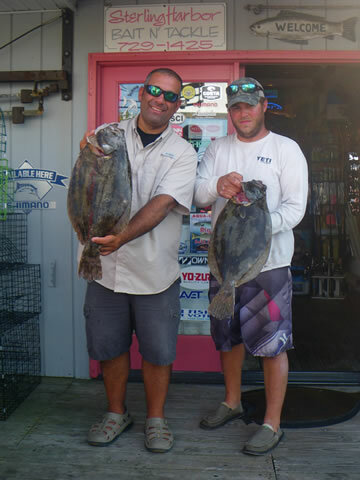 Drew Kelly of Philadelphia, PA (right) with a 7.95 pound flounder and Chris McCutcheon of West Chester, PA with a 4.51 pound flounder caught while drifting live minnows on a Hobie Mirage Outfitter Kayak in the Wildwood back bays. 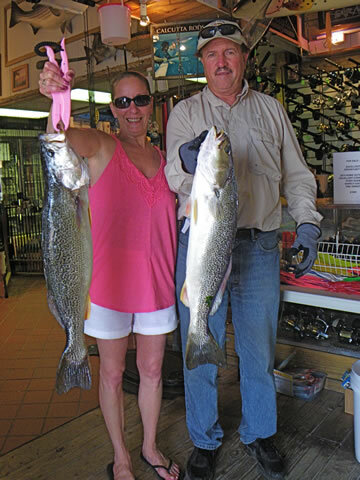 Carol O'Connor and Bill Collins of Glendora, NJ with a 7.5 and a 7.85 pound weakfish caught on a Mirr-O-Lure while fishing a local jetty. 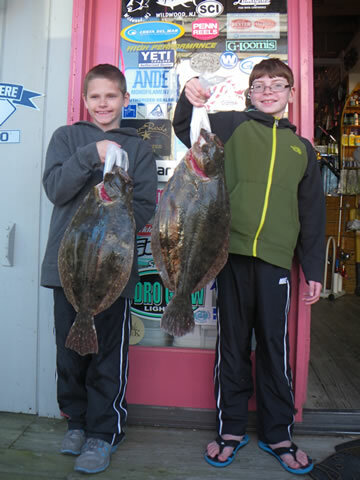 On their first ever saltwater fishing trip, Chris Philbrick and eleven year old Samuel Philbrick of Lumberton, NJ caught a 6.42 pound flounder, and a 3.37 pound flounder at the Cape May Reef while fishing on Bill Stewart's boat "Tuna Can" out of Wildwood, NJ. 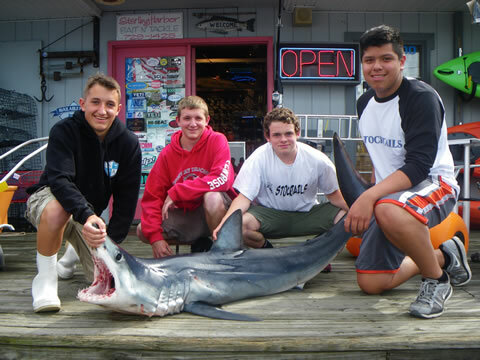 The crew of "Stocktails" out of Wildwood, NJ with a 137 pound Mako Shark boated by angler Christian Penrose (2nd from left), age 18 of Swedesboro, NJ. 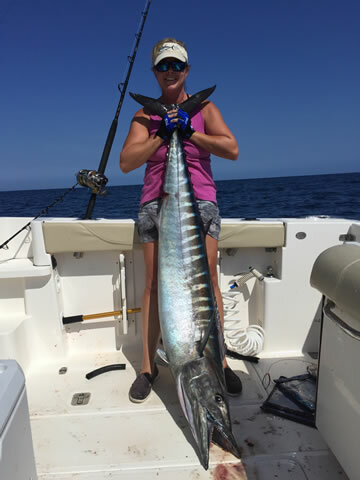 The fish measured 73 inches and took a mackerel. 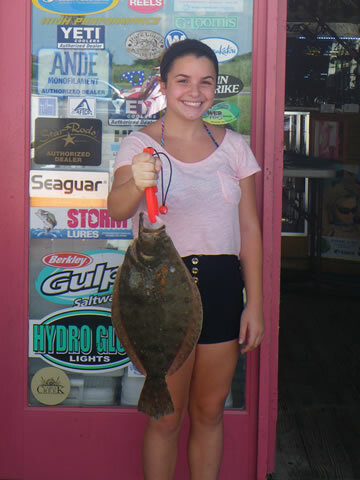 Courtney Flynn of Audobon, PA weighed in a 3 pound 15 ounce flounder caught on a live minnow near turtle Creek on "Accipiter" out of Wildwood. 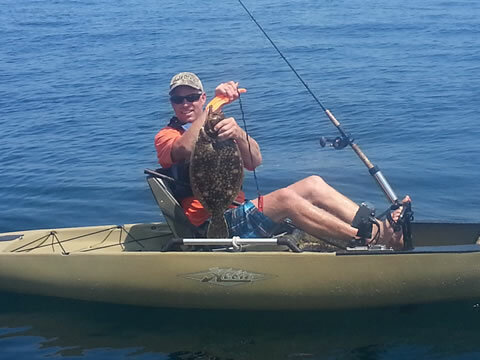 Charles Breon of Villas, NJ with a nice back bay flounder caught while fishing on his Hobie Mirage Outback kayak. 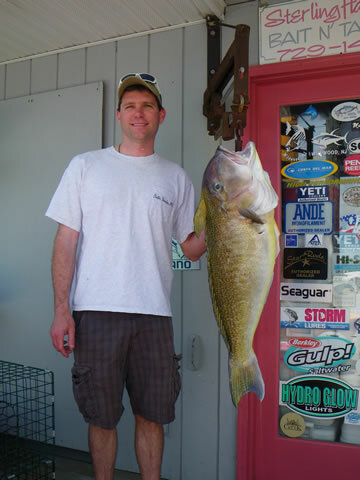 Joe Gillen of Wildwood, NJ with a 32 pound golden tilefish caught at the Baltimore Canyon on his boat "Y-Knot". 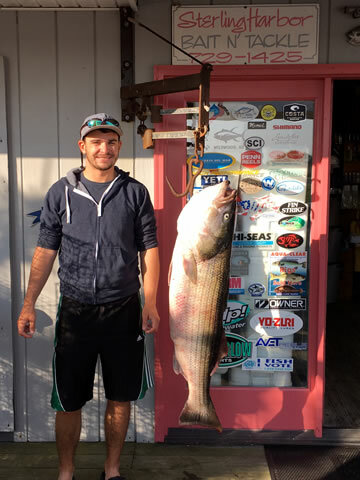 Luke Dombrowski of North Cape May checked in with a 75.5 pound Black Drumfish caught in the Delaware Bay on his boat "Thunder". 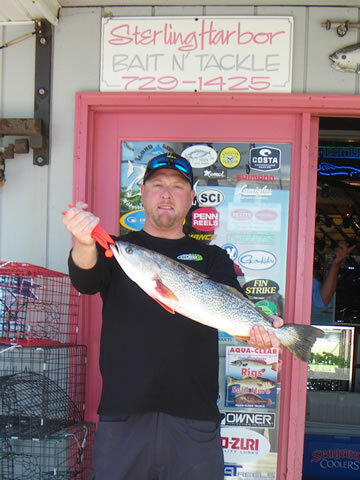 Jason McFarland of Oceanview, NJ weighed in an 8 pound 10 ounce weakfish measuring 29 inches. 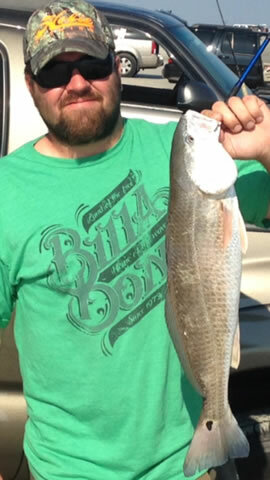 The fish was caught on a pink Zoom in the Grassy Sound area. 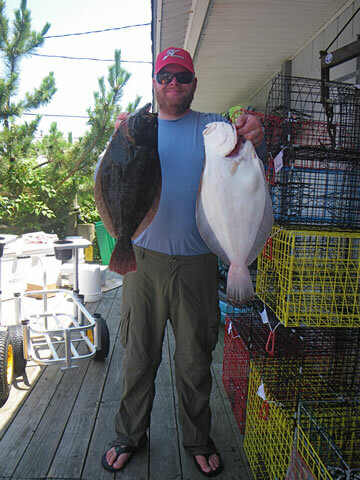 Frank Mikulak of Philadelphia, PA weighed in his first ever Black Drumfish that tipped the scale at 72 pounds. 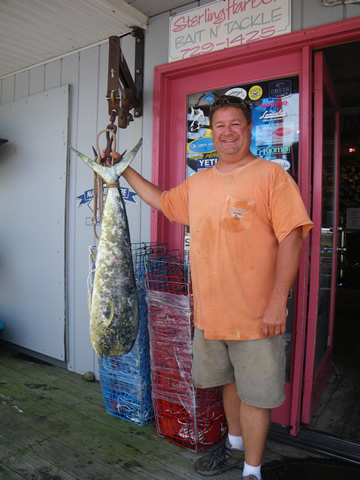 He caught the fish in the Delaware Bay on Doug DeBlieu's boat Ever Endeavor out of Wildwood. 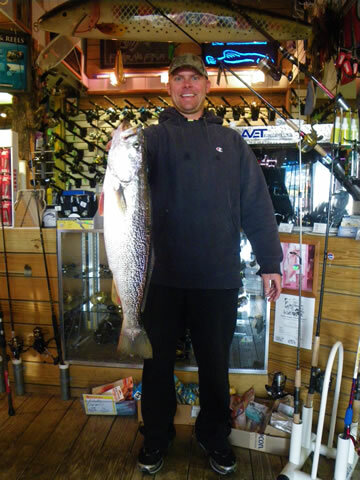 Mike Sullivan of Warrington, PA checked in with a 6 pound 7 ounce weakfish caught on Gulp! behind the Wildwoods. 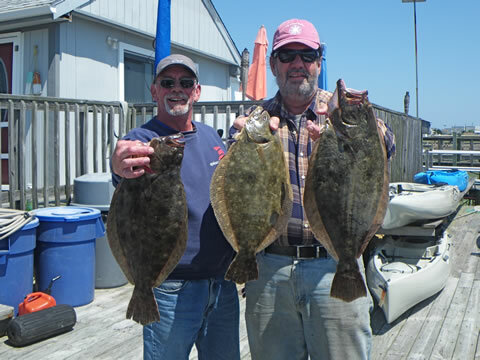 Bruce Fish of Wildwood and Don Friel of Goshen with 3 keeper flounder up to 22 inches caught on opening day. 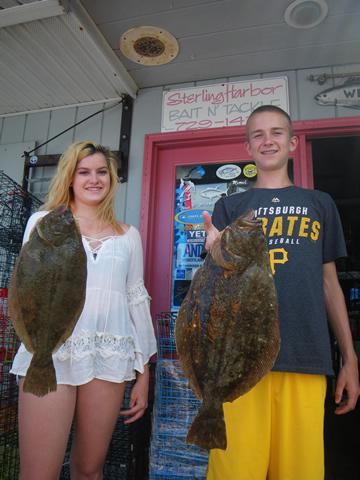 DJ Zolna and Griffin Yerk, aged 11 of Rio Grande, NJ weighed in a 3 pound 10 ounce flounder and a 4 pound flounder caught while fishing on Dan Zolna's boat "Accipiter" out of Wildwood. The fish were caught on a bucktail/gulp combo. 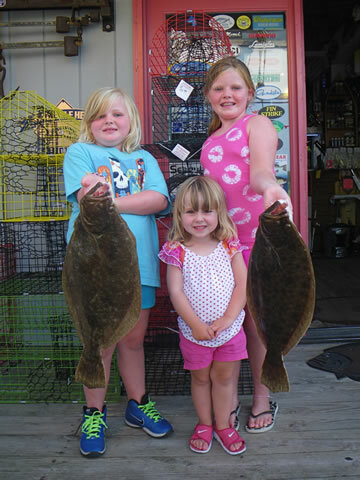 Malaina, age 8 and Karleigh, age 5 Preston of Drexel Hill, PA weighed in a 3 pound 2 ounce and a 2 pound five ounce flounder that they caught on Gulp! while fishing on Dad's boat behind Wildwood. 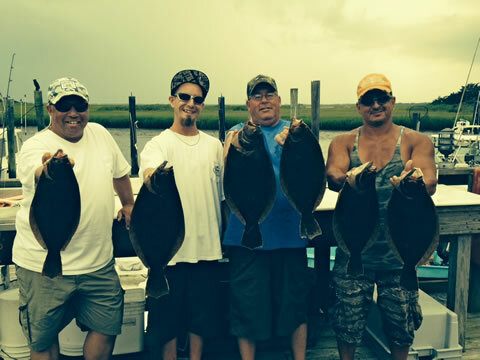 Frank Scirrotto of Cherry Hill, NJ had 3 keeper flounder from 18.5 - 22 inches while fishing a bucktail/Gulp! 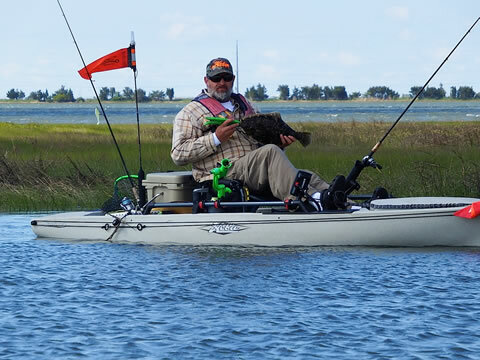 combo on his Hobie Mirage Pro Angler 12 kayak. 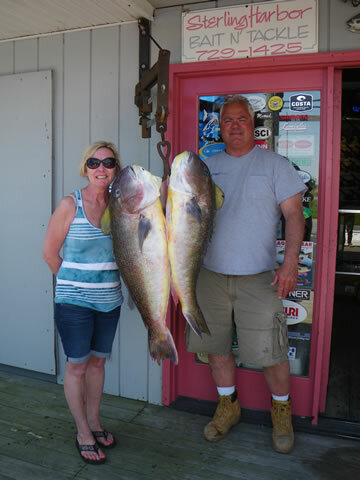 Greg and Cheryl Bulifant of Cape May Court House, NJ with a 35 pound and a 27 pound golden tilefish caught while fishing the Wilmington Canyon on Joe Gillen's boat the "Y-Knot" out of Wildwood, NJ. 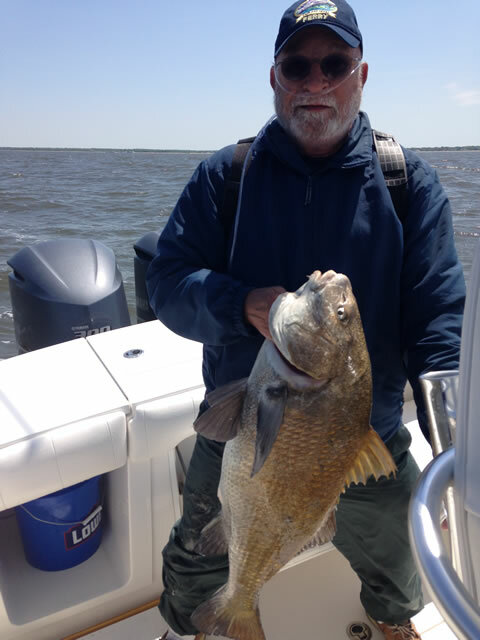 Dave Hirsch from Cape May Court house, NJ with a nice black drum caught on fresh clam in the Delaware Bay. 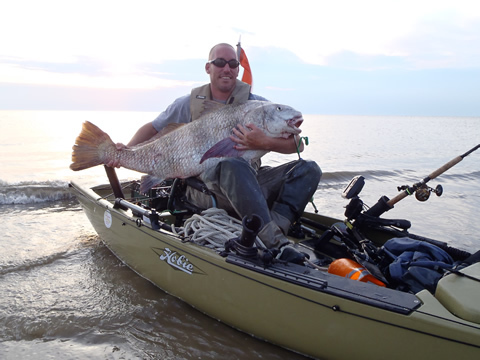 Mike Brier of villas, NJ with 2 black drumfish to 80 lbs caught on fresh clam while fishingg on his Hobie Mirage Pro Angler 14 kayak in the Delaware Bay. 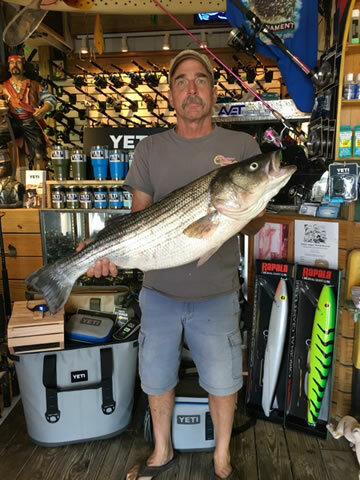 Dr. George Reinhart of North cape May, NJ landed this 29.6 pound striped bass on a bunker chunk in the Delaware bay while fishing on his Hobie Mirage Outback kayak. Capt. 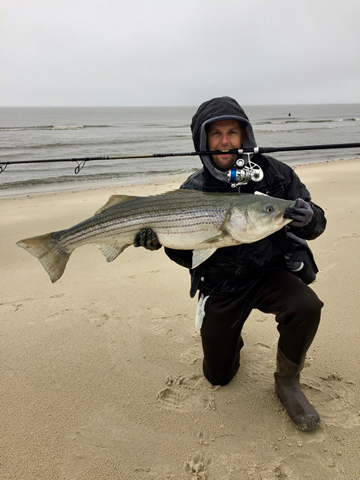 Dan Zolna of Rio Grande, NJ and Team Accipiter with a nice catch of Striped Bass to 26 pounds caught while working a bird play off the Wildwood beachfront. 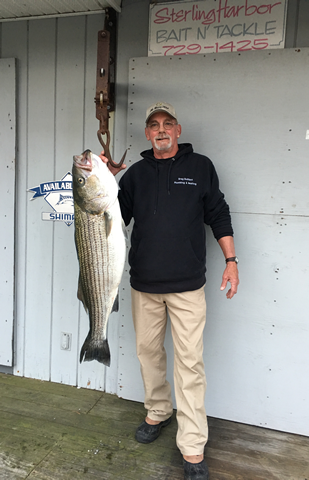 Rick Brennecke of Springfield, PA with a 43 pound Striped Bass caught while chunking bunker in the Delaware Bay on Joe Brennecke's boat "Gross Weight". 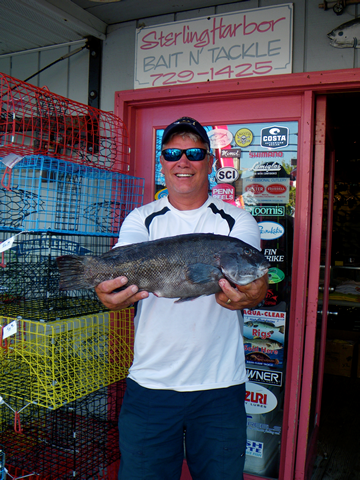 Charles Breon of Wildwood, NJ with a 2 pound 14 ounce Tautog caught while fishing from his Hobie Mirage Pro Angler. That moment you realize your net has a hole in it. 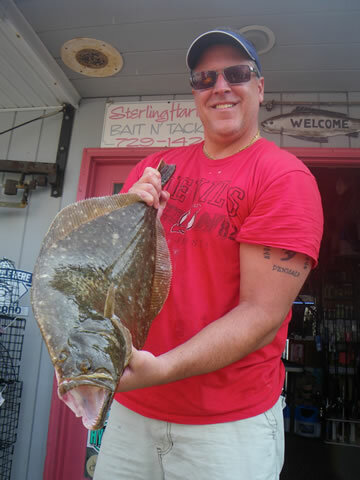 Scott Wheeler of Wenonah, NJ with a 6 pound and an 8 pound flounder caught at the Cape May Reef while fishing on his boat "Big Bone" out of Wildwood. 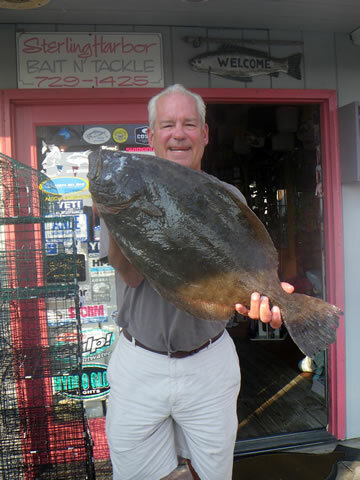 Bob Kenig of Town Bank, NJ with an 8 pound 8 ounce flounder caught while fishing the Cape May Reef on his boat "Saint Sandy II". 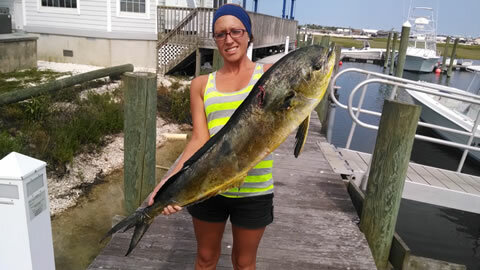 Ashley Lucadema of Cape May Court House, NJ with a 45 inch mahi-mahi caught while trolling the south shoal area. Mark Allonardo of Forest Grove, NJ e-mailed us this photo of a nice bull mahi he caught while fishing at Reef Site 11 on "Pudges Catch II". 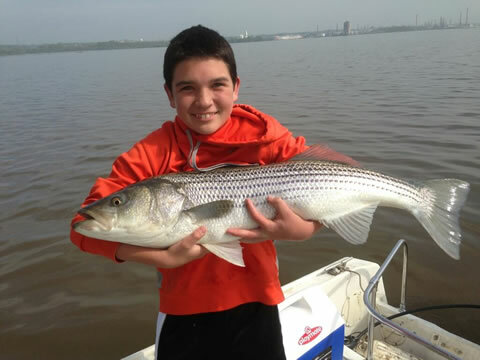 Chandler Olivieri, age 15 of Ridgefield Park, NJ with his first ever keeper striped bass that took a sardine in the back bay of Wildwood. The fish measured 30 inches. 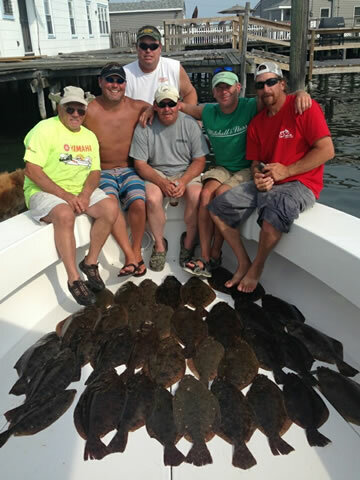 Frank Hennigan and crew of Glenmoore, PA limited out with flounder to 7 pounds while fishing on Frank's boat "Avalanche" at Reef Site 11. 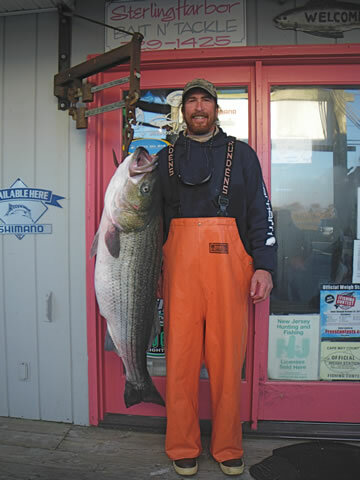 Jim Rossiter of Bridgeton, NJ with a 30 inch, 10.2 pound striped bass caught on a sardine in the back bay of Wildwood. 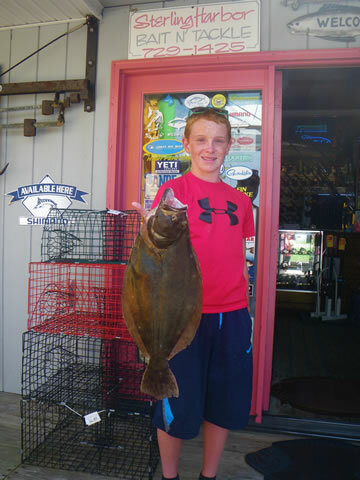 Taylor Rossister of Bridgeton, NJ with a 2 pound 14 ounce, 19 inch flounder caught in the back bay of Wildwood. 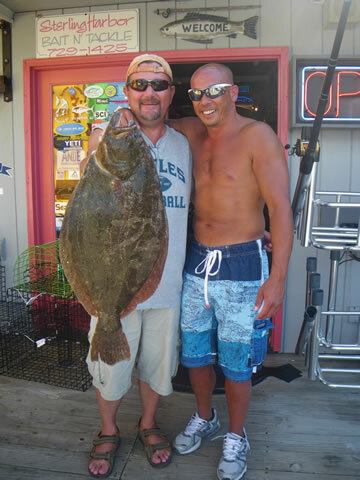 Pat Sumek and Nino Aversa of Glassboro, NJ with a 6 pound 4 ounce and a 5 pound 8 ounce flounder caught on Gulp! at the Cape May Reef while fishing on Nino's boat "El Nino". 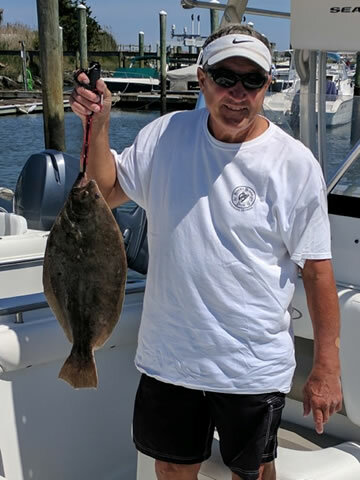 Lloyd DeNicolo of Paramus, NJ weighed in his first ever flounder at 5 pounds 15 ounces caught while fishing the Cape May Reef on Ray Dunne's boat "Dunne Dreamin'". 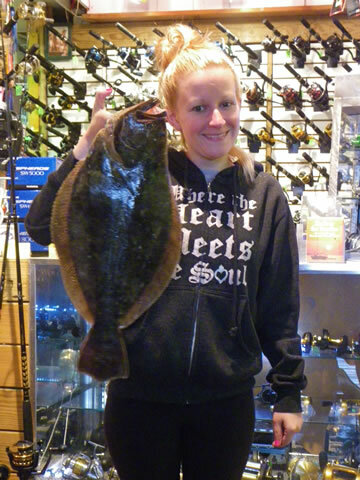 Lisa Matz of Washington Township, NJ with her first ever flounder weighing 2 pounds 9 ounces caught on clam in the back bay of Wildwood. 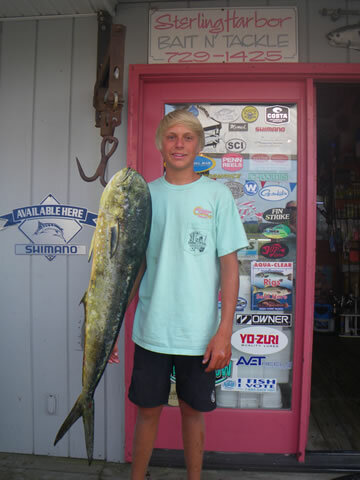 Kyle Killen, age 16, of Wildwood, NJ with his first ever mahi-mahi weighing 15 pounds. 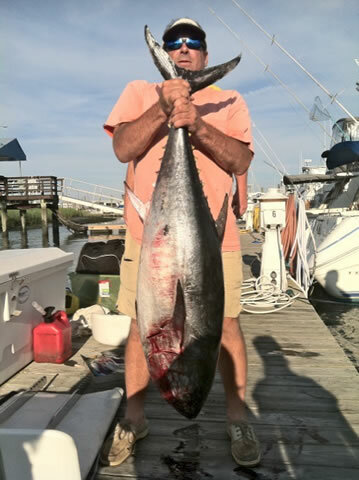 The fish was caught while trolling the Elephant Trunk area on Greg Bulifant's boat "Big Bully II" out of Wildwood, NJ. 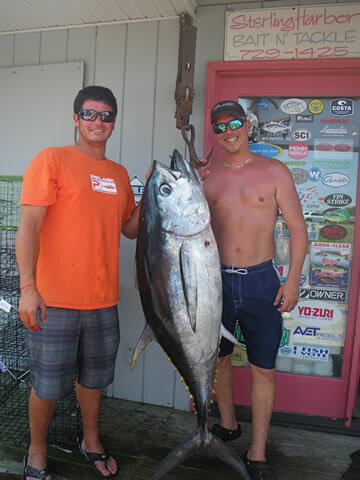 Nathan Miller (Left) of Reading, PA with a 110 pound bigeye tuna caught while trolling ballyhoo at the Wilmington Canyon on Joe Gillen's boat "Y-Knot" out of Wildwood. 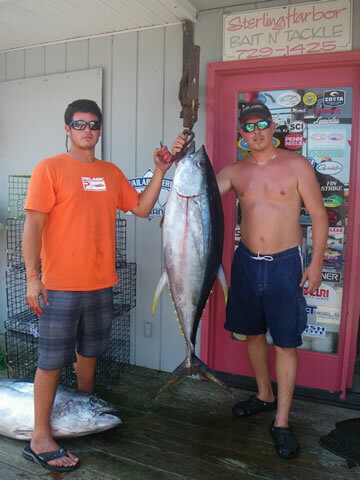 Lee Garber (right) of Boyertown, PA with a 74 pound yellowfin tuna caught while trolling the Wilmington Canyon on Joe Gillen's boat "Y-Knot" out of Wildwood. 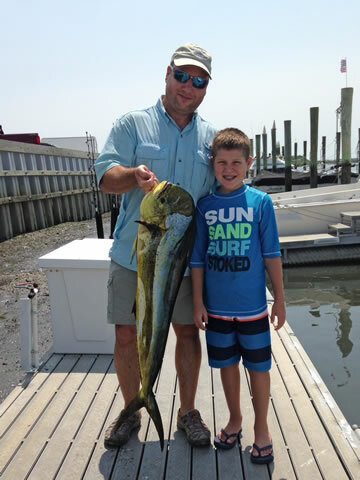 Tommy D'Alfonso of Elk Twp., NJ with a nice bull mahi caught while trolling the 30 fathom line with his Dad Tom on their boat "Reel Trouble". 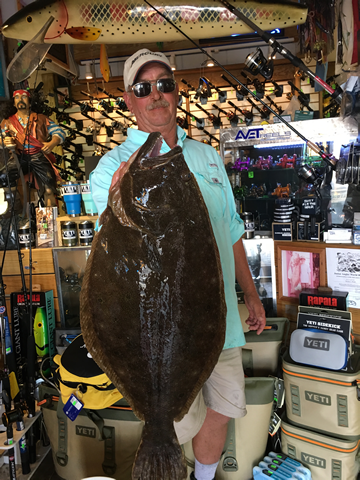 Ken Smith of Philadelphia, PA with a 6 pound flounder caught at the Cape May Reef while fishing on his Hobie Pro Angler 14 Kayak! 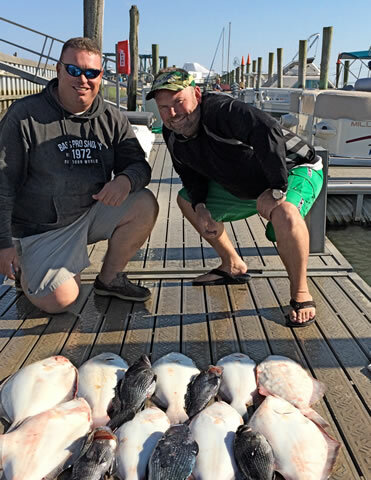 Captain Dan Guss of Erma, NJ with a 5 pound 9 ounce flounder caught while drifting the McCrie's Shoal area on Dan Zolna's boat "Accipiter"
Eric Calvitti of Warrington, PA with a 13 pound sheepshead caught while fishing behind Stone Harbor. 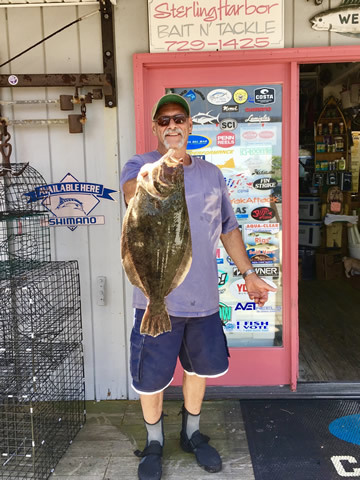 John Niewinski of Mullica Hill, NJ landed a 3 pound 15 ounce flounder on a live minnow while fishing the ICW behind Wildwood. 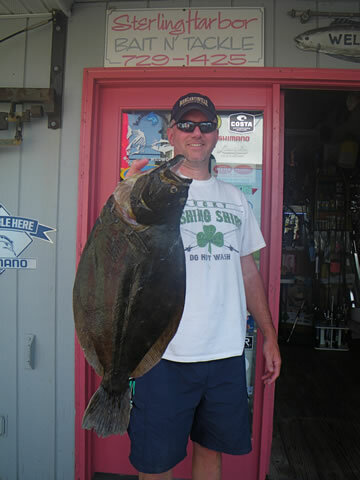 Billy Boyle of Philadelphia, PA with a 5 pound 15 ounce flounder caught on a Spro Bucktail at the Cape May Reef. 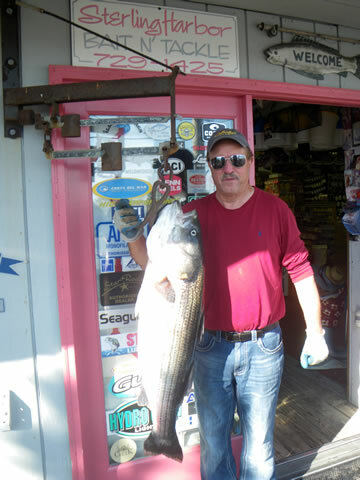 Billy was fishing on Gerald Vessels boat "Ms. Mc K&A III" out of Wildwood, NJ. 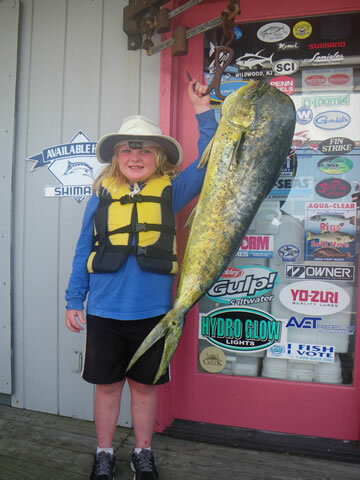 Allyson May Vessels, age 7, of Wildwood, NJ landed her first ever mahi-mahi that tipped the scales at 23 pounds! Allyson was trolling the 5 Fathom Bank area with her Dad, Gerald on their boat "Ms. Mc K&A III". 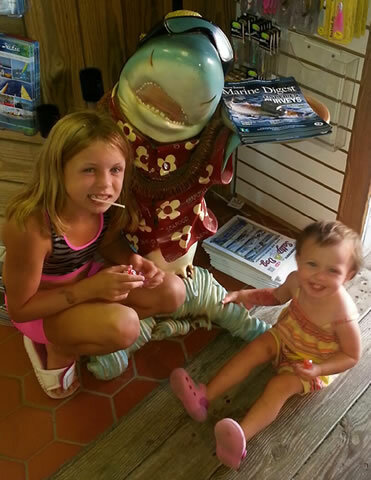 Ava and Casey “sharkin’ @ Sterling Harbor Bait & Tackle. 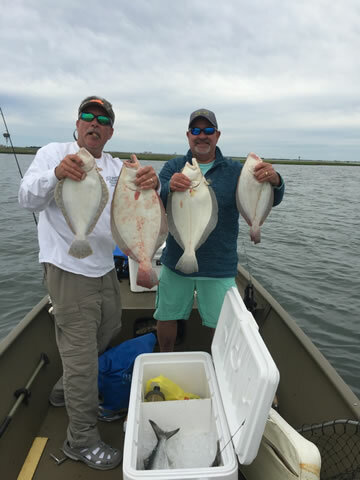 Bill Stewart of Swedesboro, NJ and crew with a nice catch of flounder from the Wildwood Reef while fishing on Bill's boat "Tuna Can". Mike Woertz of Runnemede, NJ with a whopper 7 pound 12 ounce Flounder caught on a Spro Bucktail in the back bay near Grassy Sound. 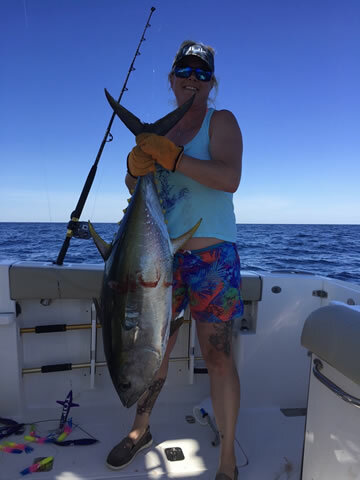 Suzanne Smith of Philadelphia with a 20 pound maui-mahi caught while flounder fishing at Reef Site 11 on her boat Tuna Chic. 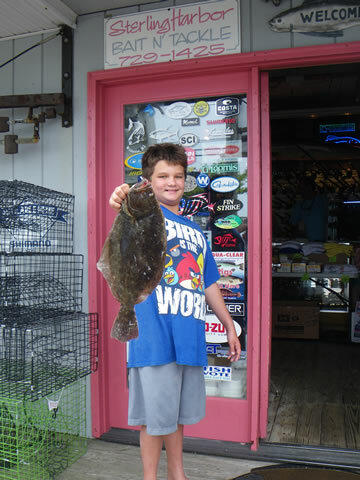 Lil' Mike Reed, age 10 of Rockledge, PA with a 24 inch Flounder caught while fishing with Dad at the Cape May Reef. 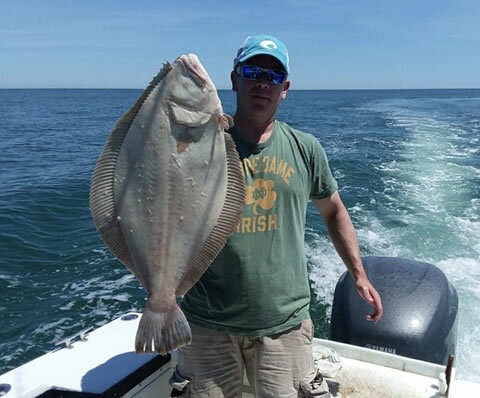 Sean Bulifant of Cape May Court House, NJ with a 4 pound 15 ounce Flounder caught on a live minnow in the Wildwood back bay. 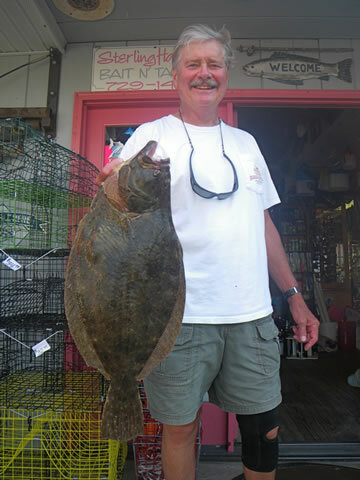 Scott Harbison of Monroeville, NJ with a 4 pound 11 ounce flounder caught on a live minnow in the ICW near Grassy Sound. 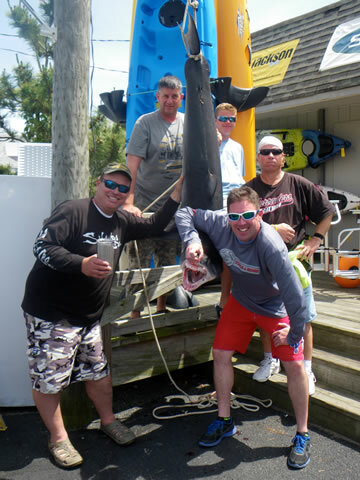 Mike Reed and crew of Rockledge, PA with a 203 pound Mako Shark caught while fishing on Mike's boat "Kensington Princess II" near the Cigar area. 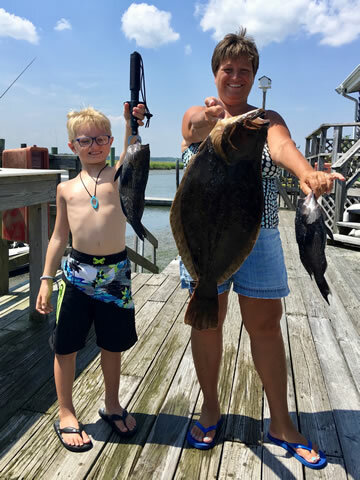 Donna Stewart of Swedesboro, NJ with her first Flounder of the season; a 3 pound 14 ounce fish caught while drifting spearing at Reef Site 11 on her boat "Tuna Can". 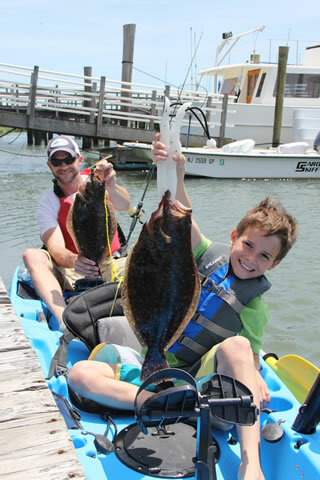 LJ Beswick, age 7, of West Chester, PA with a 25 inch flounder caught at Reef Site 11. 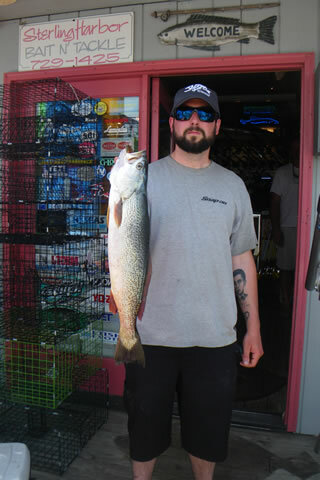 Jason Bailey of Conshohocken, PA landed this 5 pound 11 ounce weakfish while fishing on George Danley's boat "Liquid Asset" out of Wildwood, NJ. 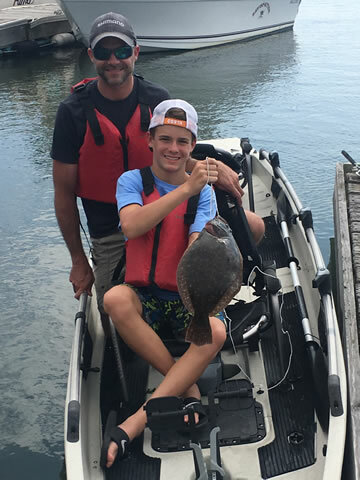 Patrick Latham and son Carson of Ewing, NJ ventured out on Father's Day for their first Hobie Kayak fishing experience and landed two nice fluke for dinner! Way to go guys! 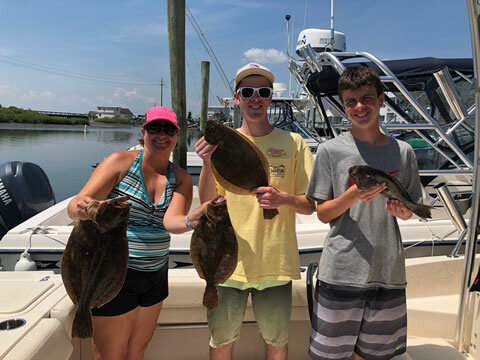 Scott Wheeler and crew of Wenonah, NJ with a nice catch of flounder from Reef Site 11 while fishing on Scott’s boat “Big Bone" out of Wilwood, NJ. 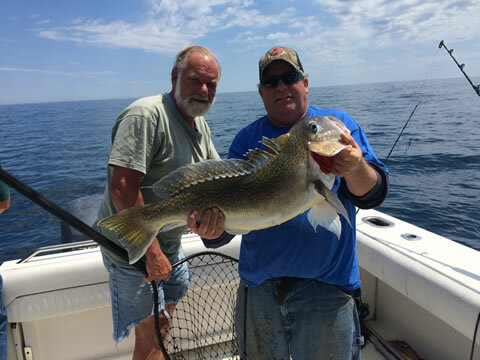 Bob Bigwood of Woolwich Township, NJ with a 31 pound Tilefish caught while fishing offshore on his boat "A Toy Story" out of Wildwood, NJ. 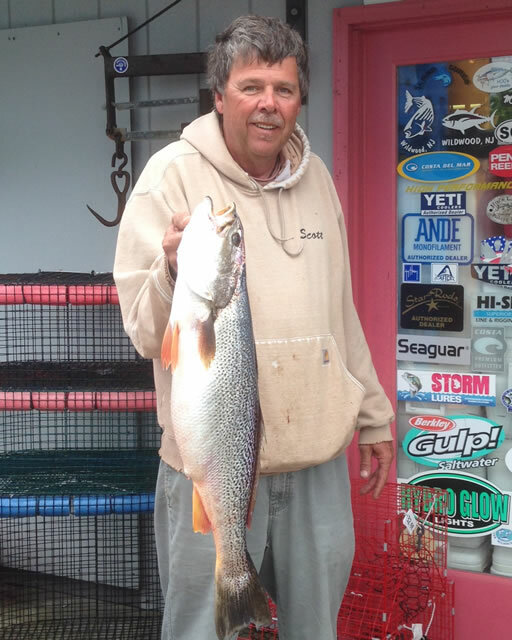 Bud Garozzo of Swedesboro, NJ with a 5 pound 11 ounce Weakfish caught while drifting a Gulp! Swimming Mullet on his Hobie Mirage Pro Angler 14 kayak near Grassy Sound. 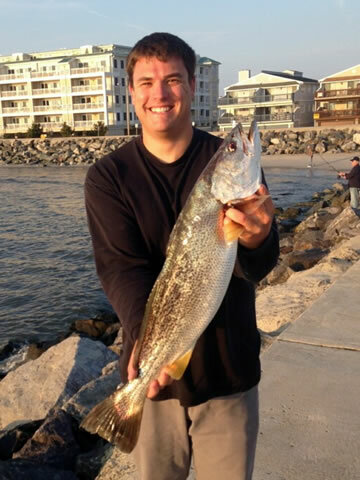 Bobby Greenling of Marmora, NJ with a nice Weakfish caught near a local jetty. Bill Hansen of Philadelphia with a 5 pound 10 ounce Weakfish measuring 28 inches, caught on a Jighead/plastic worm near Cape May Point. 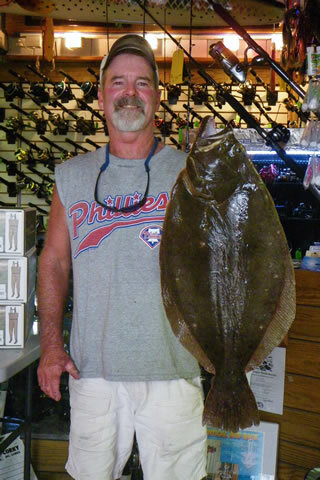 Jim Rossiter of Bridgeton, NJ with a 4 and a 5 pound Flounder caught while fishing a bucktail with Gulp! on his Wilderness Systems Tarpon kayak. 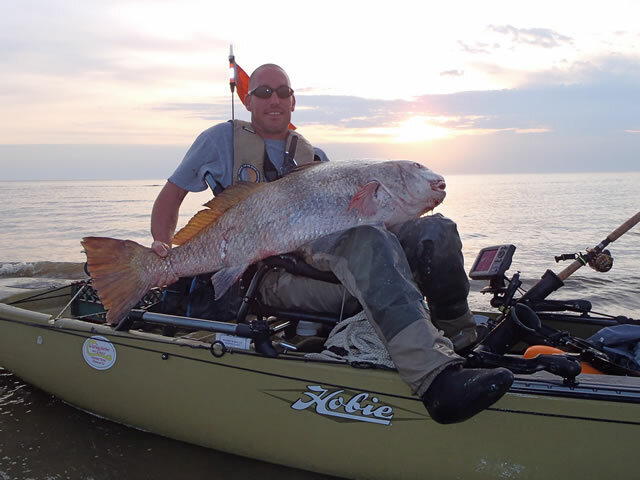 Mike Brier of Villas, NJ with a 59 pound black drumfish caught while fishing the Delaware Bay on his Hobie Mirage Pro Angler 14 kayak. 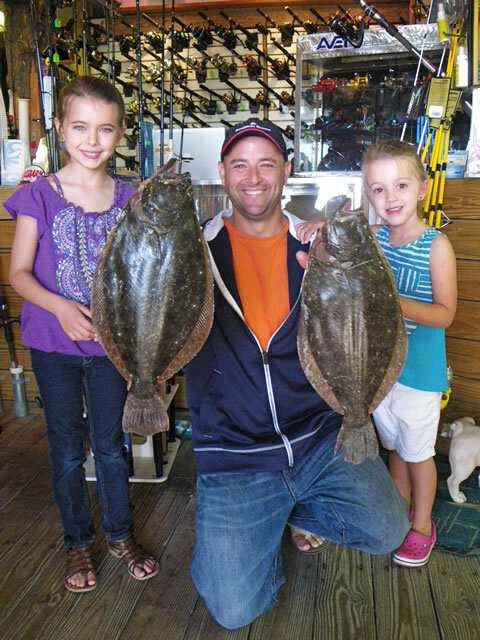 Seven year old Malaina and four year old Karleigh Preston of Drexel Hill, PA landed a pair of nice keeper flounder on Gulp! while fishing with Dad in the back bays of Wildwood. 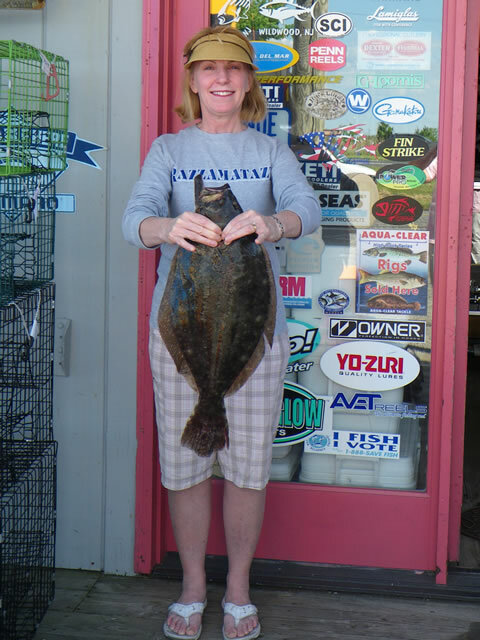 Peggy Kelley of Pittsgrove, NJ landed her personal best Flounder measuring 25 inches and weighing 5 pounds 5 ounces while fishing the ICW behind Wildwood on her boat Razzamatazz. 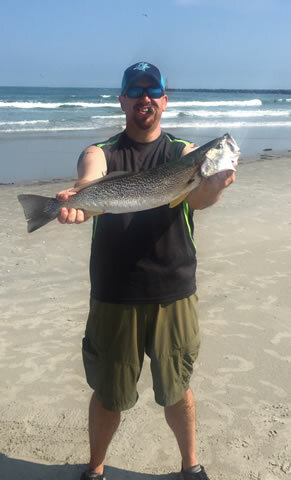 Scott Pierce landed this 28 inch, 8 pound 3 ounce Weakfish on a pink Zoom behind North Wildwood. 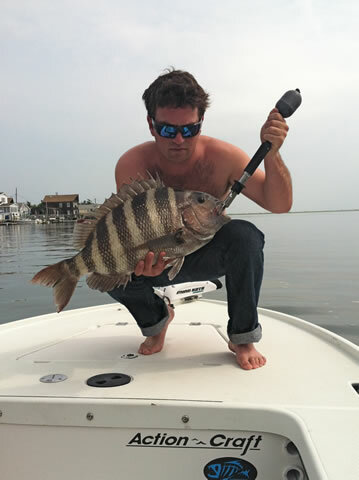 Corey Clark of Wildwood, NJ with his first ever Delaware Bay black drumfish that weighed in at 72 pounds! 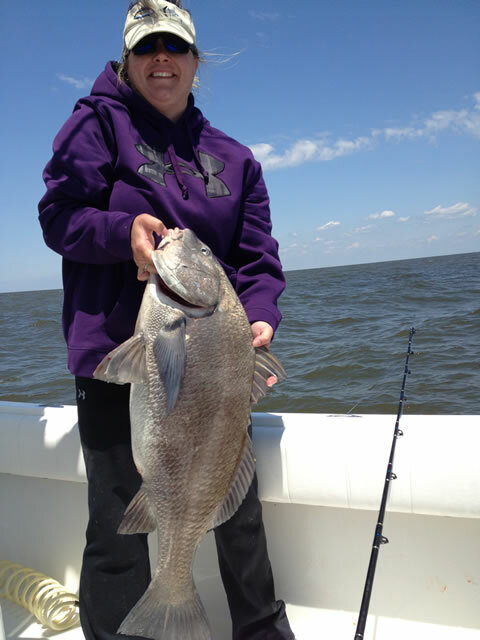 Sharon Bigwood caught and released a 50 inch Black Drum while fishing the Delaware Bay on her boat "A Toy Story" out of Wildwood, NJ. 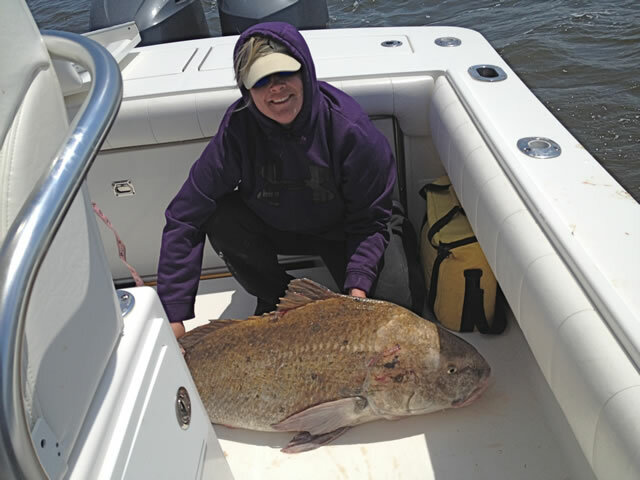 Sharon Bigwood of Woolwich Twp., NJ with a 38 inch black drum caught in the Delaware Bay while fishing on her boat "A Toy Story" out of Wildwood, NJ. 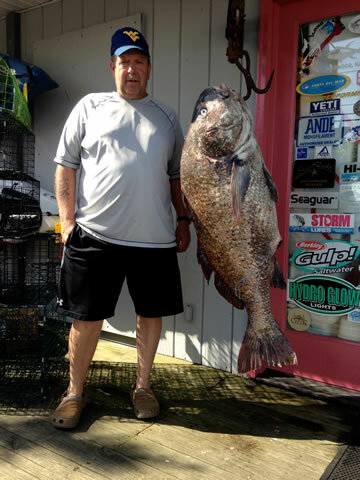 John Fisher with a nice 37" black drum caught while fishing on his daughter's boat "A Toy Story" out of Wildwood, NJ. 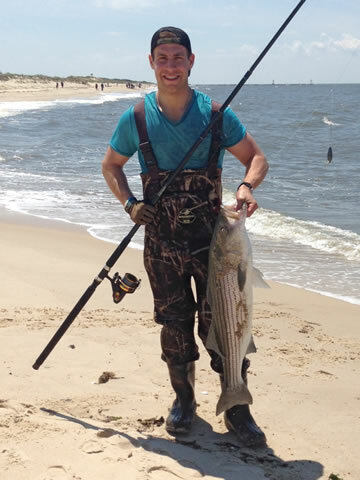 Mikey Sorgentoni of Cherry Hill, NJ with a nice striped bass caught in the North Cape May surf. 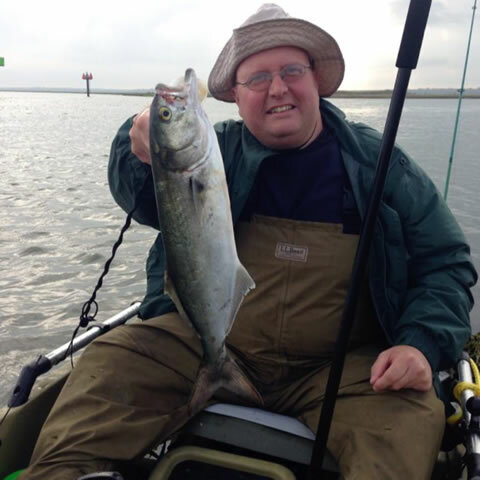 Officer Ed Brown of Williamstown, NJ with one of many nice Bluefish caught while fishing on his Hobie Mirage Pro Angler 14 Kayak. Cole Valente from Mantua, NJ has been having a great year on the Delaware River hooking up with some nice size stripers almost every time he’s been on the water. 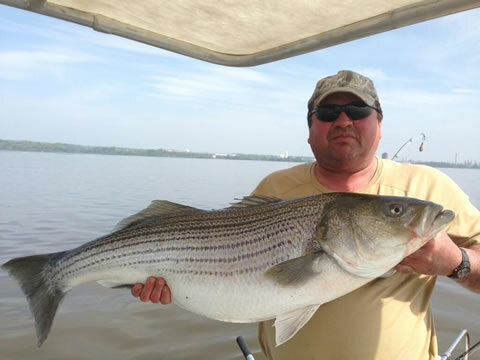 Mike Salinas with one of many big stripers he caught in the Delaware River this spring. 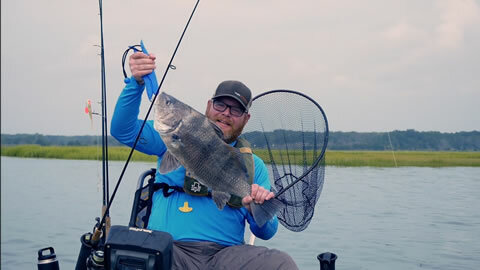 Mike Brier of Villas, NJ with a nice black drumfish caught while fishing the Delaware Bay in his Hobie Mirage Pro Angler 14 kayak. 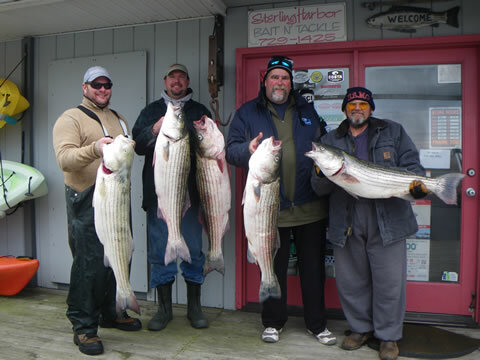 Bob McCormick of Pottsville, PA and crew of the Happy Our out of Wildwood with a nice catch of Striped Bass caught while chunking in the Delaware Bay. 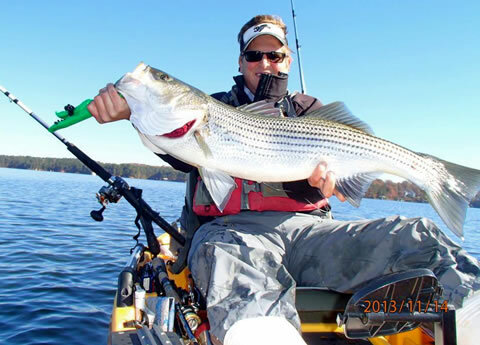 Bill Bittmann of South Dennis, NJ with a 15 pound Lake Lanier Striper caught on his Hobie Pro Angler 14 Kayak. 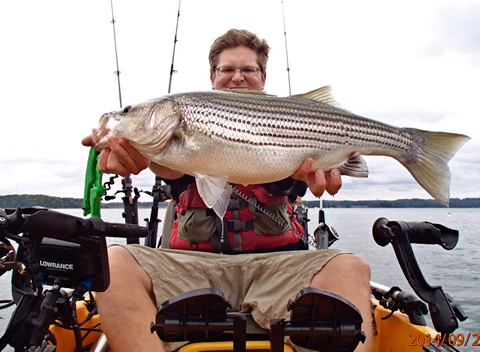 Jesse Ebert of Williamstown, NJ putting a whooping on the Bass with his new G Loomis NRX Rod. 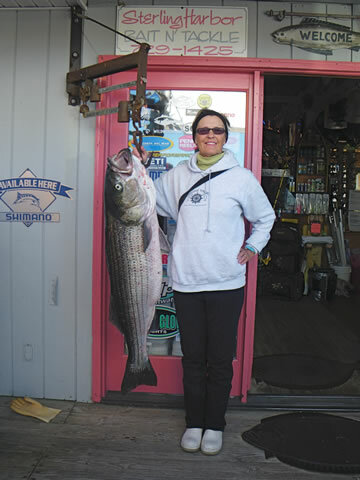 Paula Kline of Rio Grande, NJ with her 46 pound Striped Bass caught in the Cape May Rips while fishing on George Danley's boat "Liquid Asset". 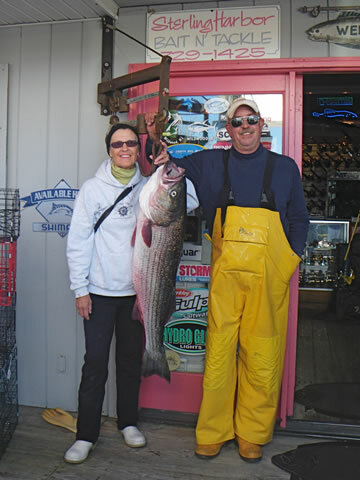 Paula Kline and George Danley with a 36 pound Striped Bass caught while fishing the Cape May Rips on George's boat "Liquid Asset". Mike "Bird" Frank of Mullica Hill, NJ with a 53 pound Striped Bass caught while chunking bunker in the Delaware Bay on his boat "Bird". Mike Brier of North Cape May had a great day of Togging the jetties with green crab on his Hobie Mirage Pro Angler kayak. 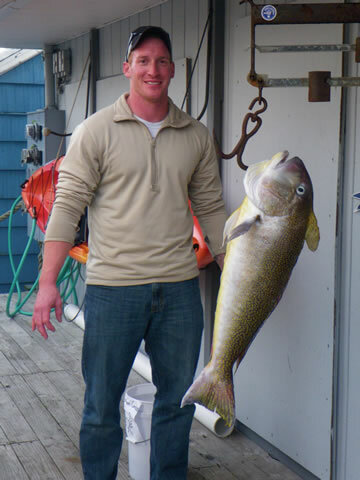 Reid Hlauka weighed in a 30 pound Golden Tilefish caught at the Baltimore Canyon on Joe Gillen's boat "Y-Knot" out of Wildwood, NJ. 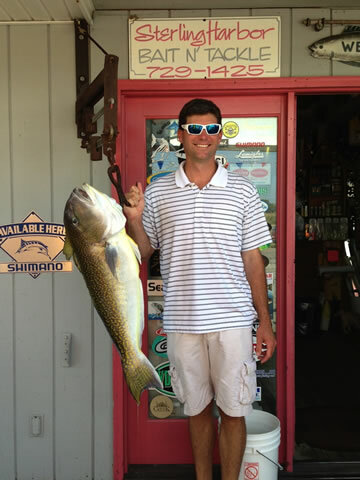 The crew had a total of 10 Golden and 2 Grey Tilefish. 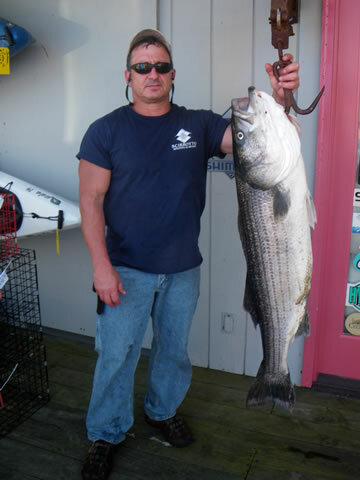 Frank Scirrotto of Cherry Hill with a nice keeper Bass that hit a whole Sardine in the Wildwood back bays. 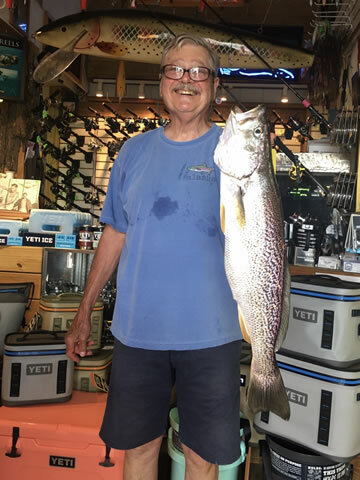 Bob Bigwood of Woolwich Twp., NJ with a 22 pound Golden Tilefish caught at the Baltimore Canyon while fishing on his boat "A Toy Story" out of Wildwood, NJ. 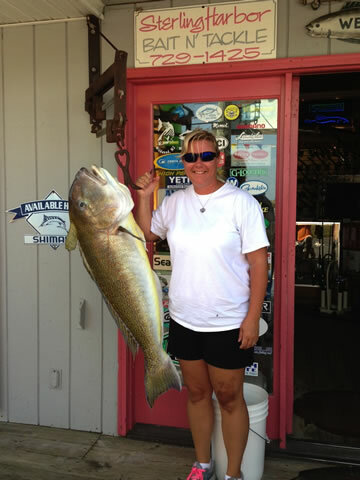 Sharon Bigwood of Woolwich Twp., NJ with a 39 pound Golden Tilefish caught at the Baltimore Canyon on her boat "A Toy Story" out of Wildwood, NJ. 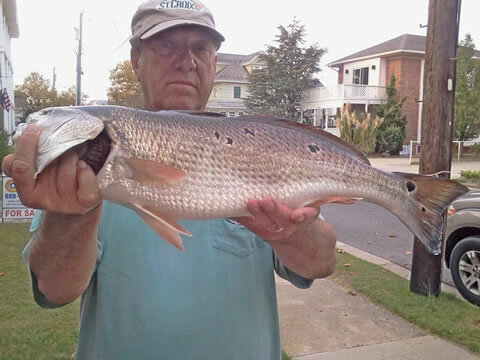 Dave Tooley of North Cape May with a 24 inch Red Drum from the Wildwood surf. 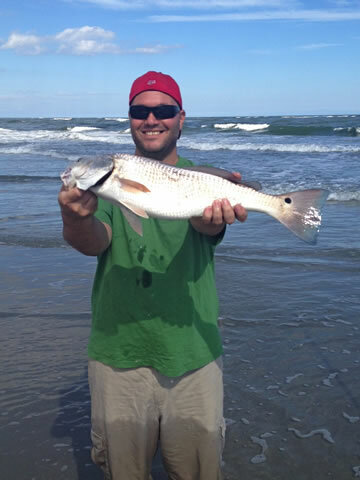 Charles Parker of Wildwood with a 25 inch Red Drum from the Wildwood surf. 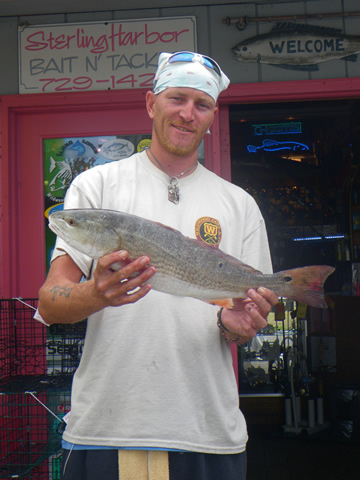 "Texas" Ray Pashuk of Wildwood with a 26 inch Red Drum caught on cut Mullet in the Wildwood surf. 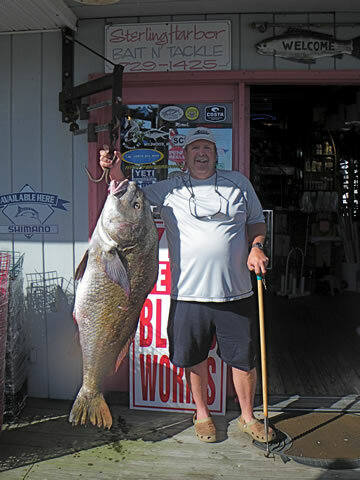 Dave Slough of Villas, NJ with a 4.25 pound Red Drum caught on Mullet in the Cape May Point surf. 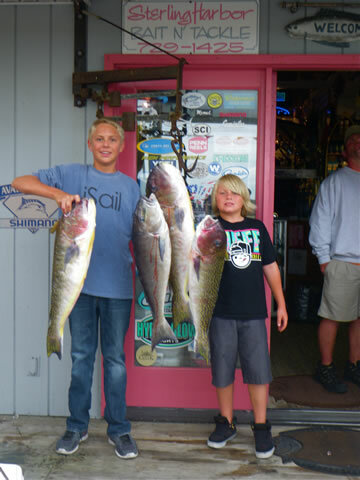 Kyle Killen, age 15 and Robbie Grant, age 10 of Wildwood with a nice catch of Golden and Gray Tilefish caught at the Baltimore Canyon while fishing on Joe Gillen's boat "Y-KNOT" out of Wildwood. 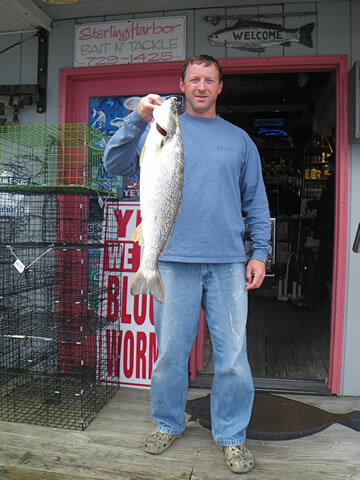 Dave Slough of Villas, NJ with a 5 pound 4 ounce Weakfish caught on spot at Cape May Point. 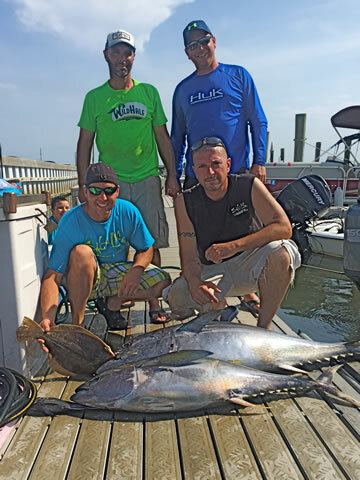 The crew from Stew's Automotive - Westminster, MD had a great day trolling for Yellowfin Tuna at the Tea Cup area on Bob McCormick's boat "Happy Our" out of Wildwood, NJ. 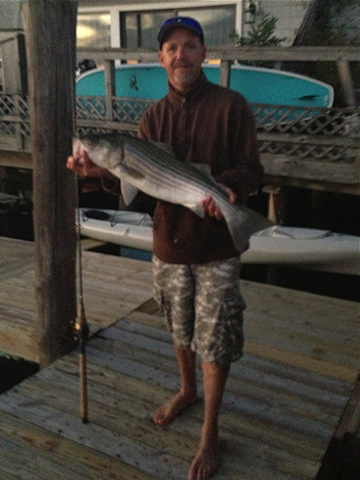 Jim Rossiter of Stowe Creek, NJ with a nice 32 inch Wildwood back bay Striper that hit a whole Mullet. 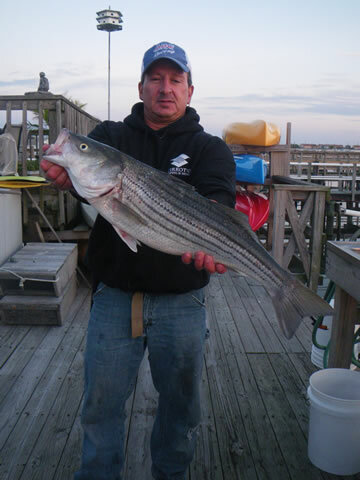 Frank Scirrotto of Cherry Hill, NJ with a 30 inch Striped Bass that took a chunked Sardine in the Wildwood Back Bay. 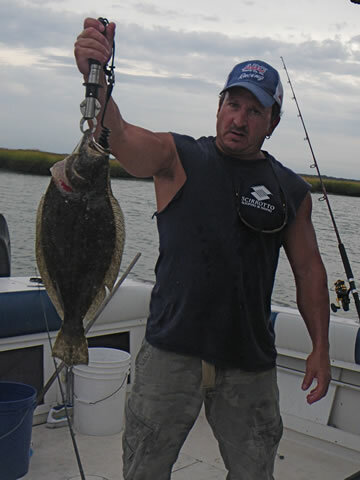 Frank Scirrotto of Cherry Hill, NJ with a 20 inch Flounder from the Wildwood back bay. 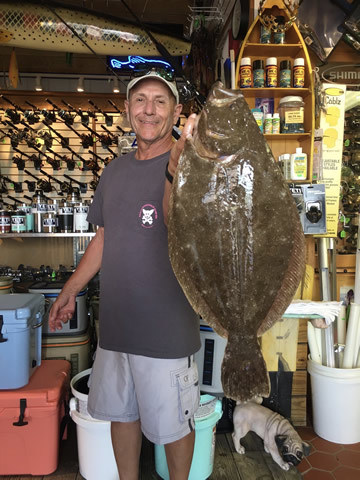 Ed Hirsh of Cape May Court House, NJ with a 5.15 and a 4.83 pound Flounder caught at the Cape May Reef while fishing on George Danley's boat "Liquid Asset" out of Wildwood. 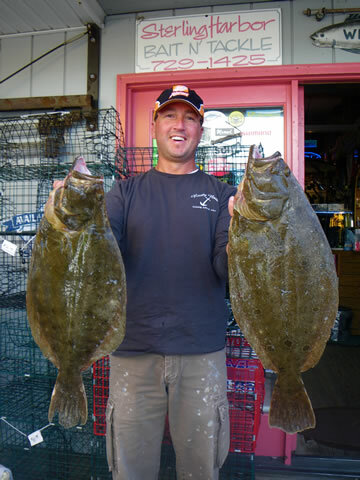 Ken Freeman of Upper Black Eddy, PA with a 9 pound 4 ounce Flounder and a 5 pound 7 ounce Flounder caught while fishing Reef Site 11 on his boat Quality Time II out of Wildwood. 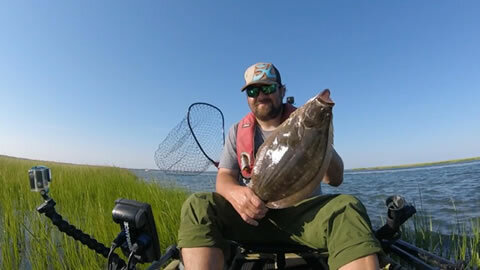 Justin Fesler of Cape May Court House, NJ with a 22 inch Flounder caught while drifting near Cold Spring Inlet on his Hobie Mirage Pro Angler custom rigged at Sterling Harbor Bait & Tackle. Capt. 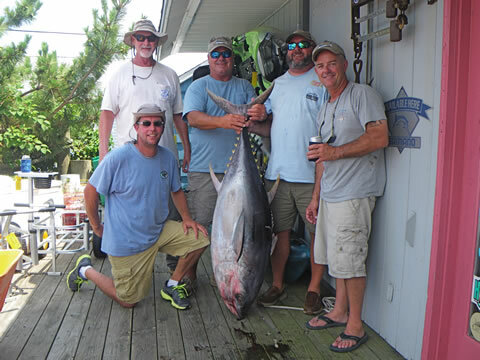 Joe Gillan and crew of the Y-Knot out of Wildwood, NJ with a 157 pound Big Eye Tuna caught on a spreader bar near the 100 Fathom line. 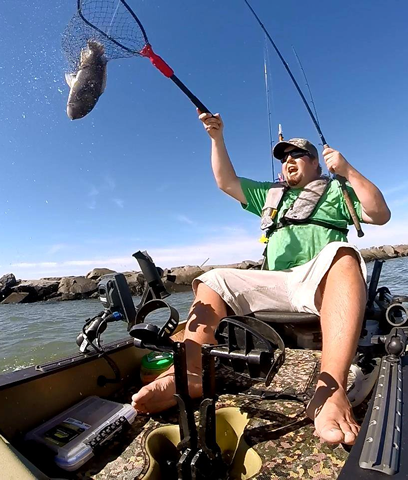 Jeff Stanton of Villas, NJ breaking in his new Hobie Mirage Pro Angler 14 Kayak with a Sand Tiger caught and released in the Delaware Bay. 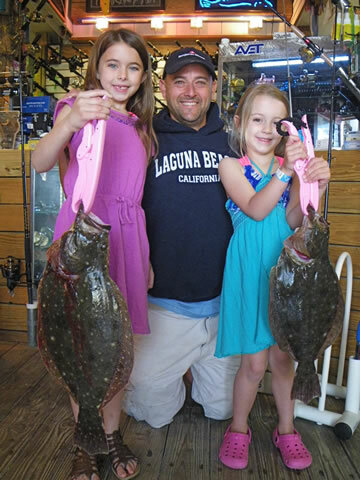 The Vessel Sisters - 7 year old Allyson with a 5.1 pound Flounder and 9 year old McKenna with a 4.6 pound Flounder caught at Reef Site 11 on Mike Gagelardi's boat "Ahhballz III" out of Wildwood, NJ. 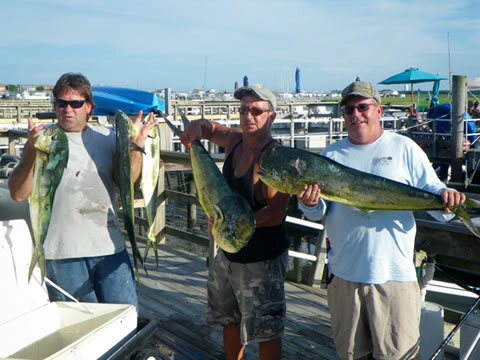 Tom Reynolds of Rio Grande, NJ and crew of Capt. 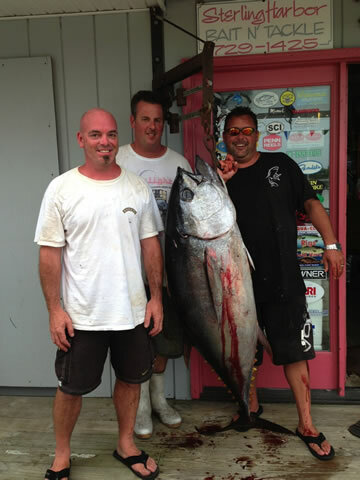 John Cimino's boat "Thunder Bird" with a 153 pound Big Eye Tuna caught on a Blue and White Illander Lure while trolling the Canyons. 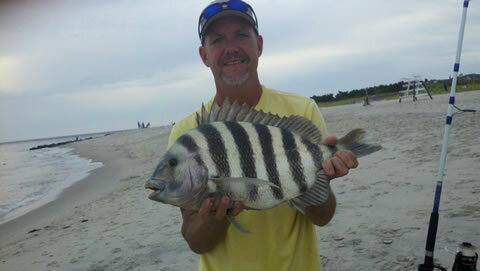 Jim Rossiter of Stowe Creek, NJ with an eight pound Sheepshead caught near Cape May Point. 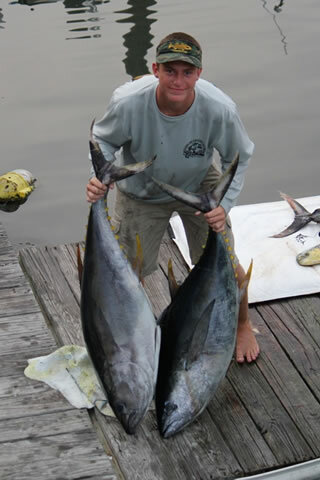 Sixteen year old Shawn McGregor of Coconut Creek, FL with his first ever Yellowfin Tuna. 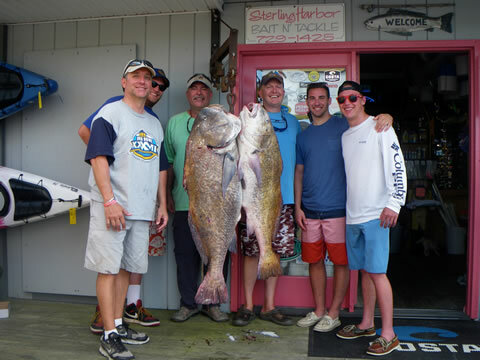 The fish weighed 75 pounds and were caught while trolling Washington Canyon on Uncle Tim McGregor's boat "Reel Maniacs" out of Wildwood, NJ. 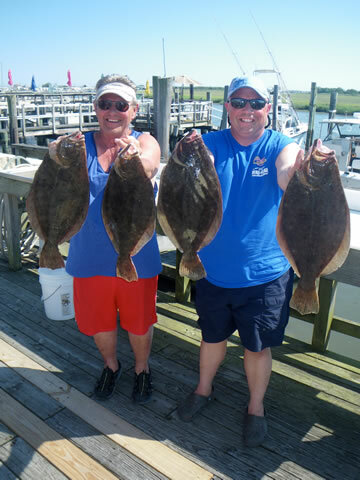 Margaret DiMatteo of Bridgeton, NJ with a nice stringer of Croakers caught in the Cape May Point surf. 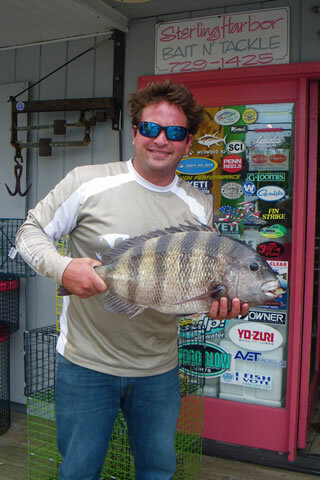 Eric Calvitti of Warrington, PA with a 12.6 pound Sheepshead caught in the Inlet on a live Crab. 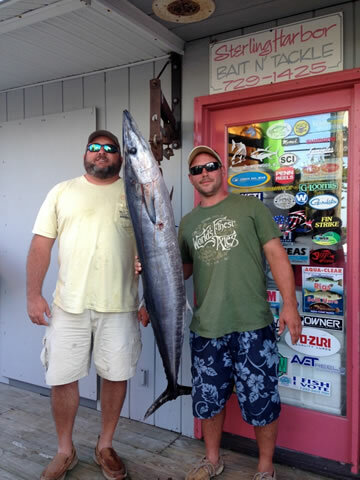 Dan Sarter of Cape May Court House, NJ and Bob Strausser of Morgantown, PA with a 50 pound Wahoo caught while trolling the near the Elephant Trunk on Capt. Joe Gillan's boat "Y-Knot" out of Wildwood, NJ. 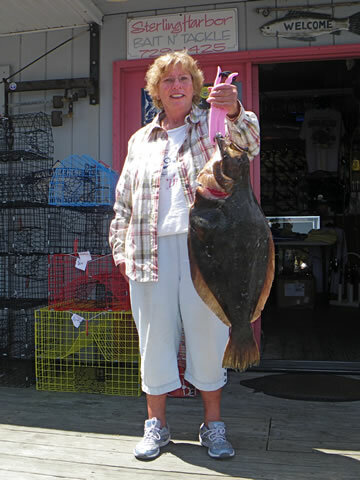 Suzanne Smith of Philadelphia, PA with an 8 pound 12 ounce Flounder caught at the Cape May Reef. 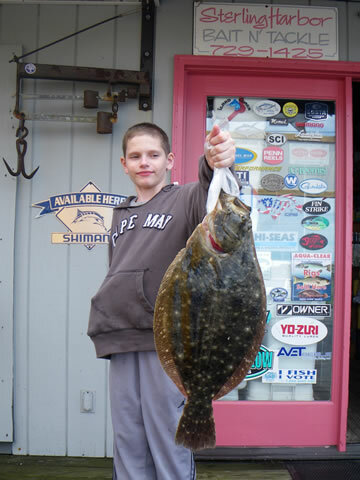 Thirteen year old Luke Hoover of Pittsburgh, PA with a 4 pound 2 ounce Flounder that hit a live Minnow/Squid combo in the back bay. 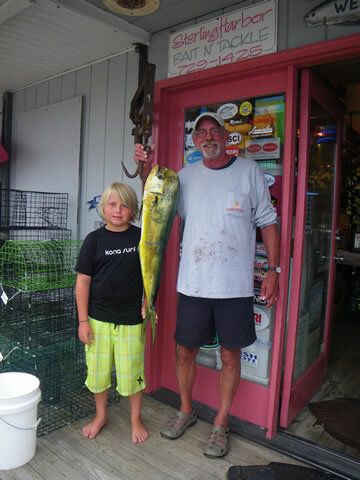 Bruce Fish and 10 year old Robby Grant with a nice Mahi-mahi caught while trolling on the Big Bully II out of Wildwood, NJ. 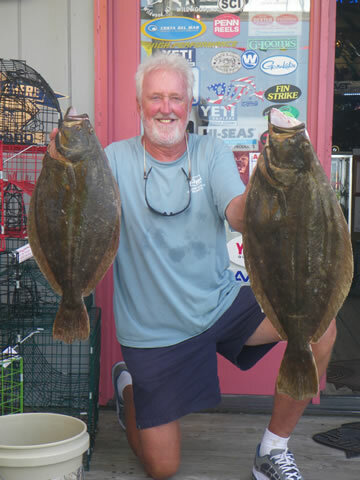 George Danley of West Wildwood fished the Cape May Reef on his boat Liquid Asset and landed a whopper 7 pound 9 ounce Flounder while bucktailing. 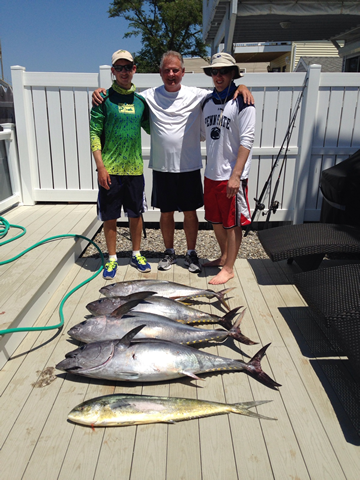 A great day of fishing was had on Ray Dunne's boat Dunne Dreamin' at the Cape May Reef. 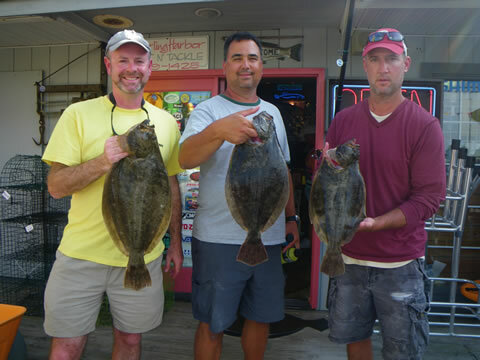 The crew had Flounder in the 3 to 5 pound range, with Ray boating a nice 5 pound 5 ounce Flatty. 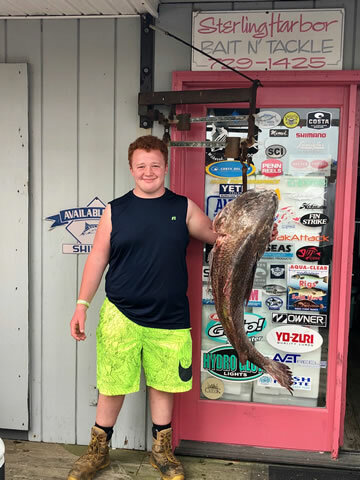 Marlin McMaster of West Wildwood checked in with a 5 pound 14 ounce Flounder caught while drifting the Wildwood Reef on his boat Wicked Witch II. Excellent day at the Old Grounds for the crew of "Big Bone" out of Wildwood, NJ. 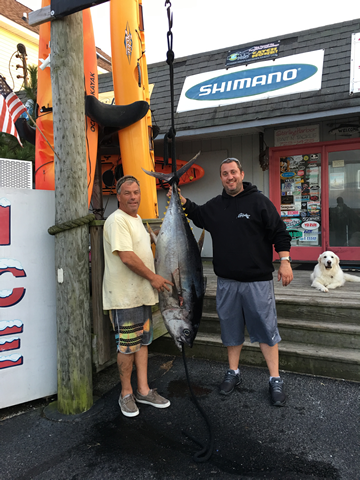 Al Messina of Warminster, PA with a nice Bluefin Tuna caught while trolling the Baltimore Canyon on Chazz Gallaghers boat Reel Classic out of Wildwood. 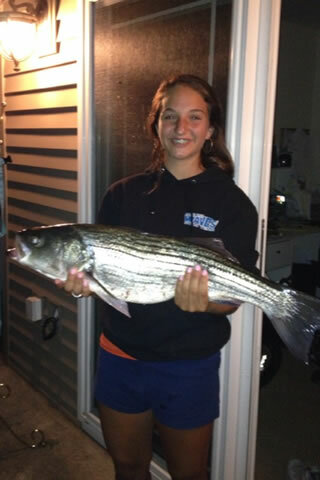 Krista Salvadore of Cape May Court House with her first ever Striped Bass measuring 30 inches. Krista caught the fish on a Yellow Bomber Lure in the Back Bay. 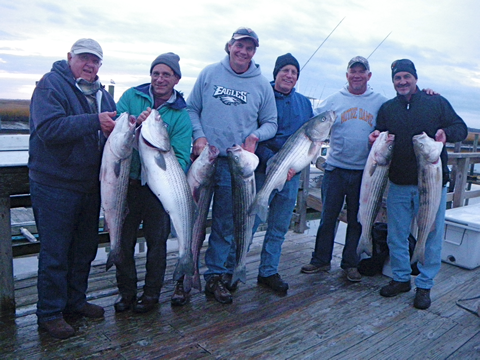 A fine day on Bill Stewart's "Cricket II" with a limit of Flatties from the Cape May Reef! 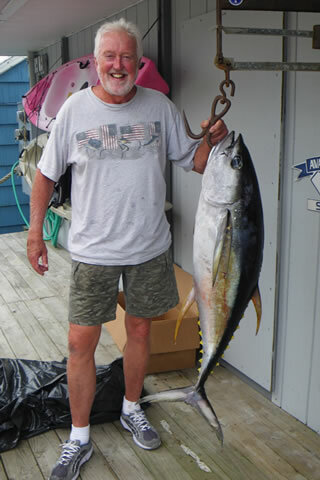 Bob McCormick of Pottstown, PA with a 54 pound Bluefin Tuna caught while trolling Ballyhoo in Massey Canyon. 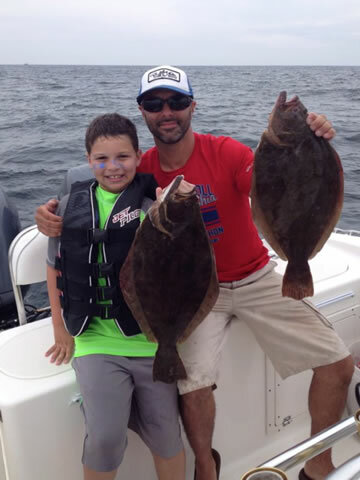 Alex Ingram (left) of King of Prussia, PA weighed in a 3 pound 3 ounce Flounder caught from the Cape May Point surf while using Gulp! for bait. 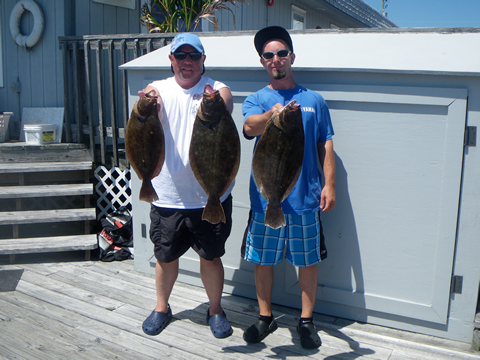 Ryan Matejik (right) of Levittown, PA had two nice keeper Flounder while fishing the same area. 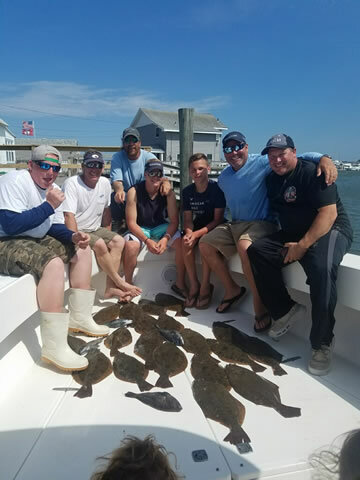 Scott Wheeler and crew of Big Bone out of Wildwood, NJ ended the day with 16 keeper Flounder while fishing the Old Grounds. 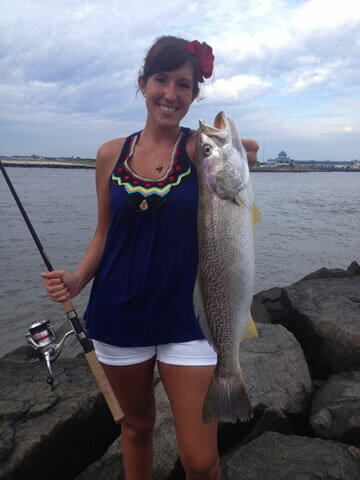 Kristin Earle of Manahawkin nailed her first ever Weakfish on a Pink Zoom from a Cape May Jetty. The fish weighed 6 pounds. 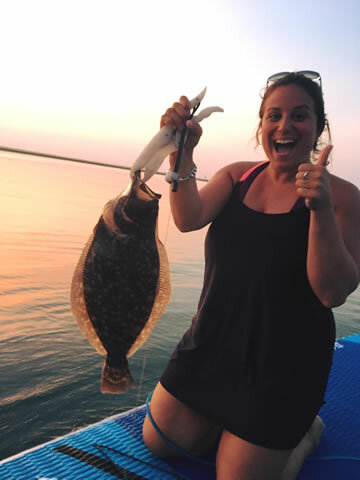 Margaret DiMatteo of Bridgeton, NJ checked in with her first ever Flounder caught while drifting a live Minnow behind Wildwood on a Hobie Mirage Pro Angler Kayak. The fish measured 18 inches.